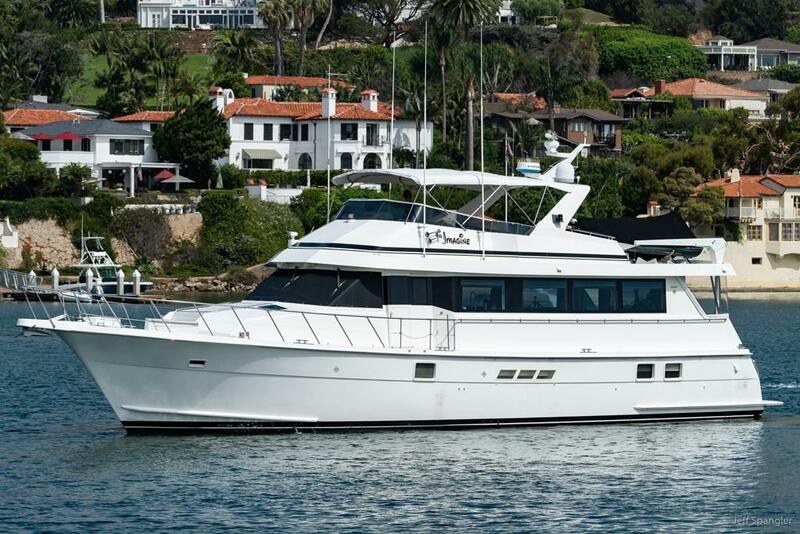 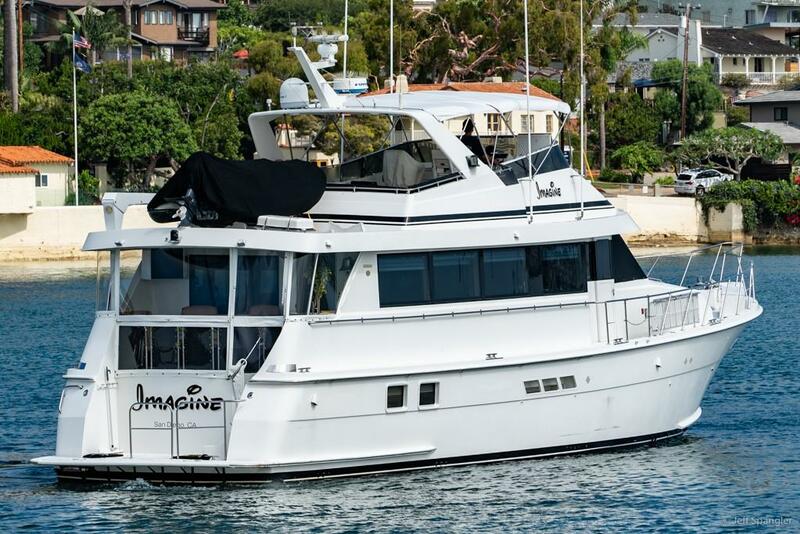 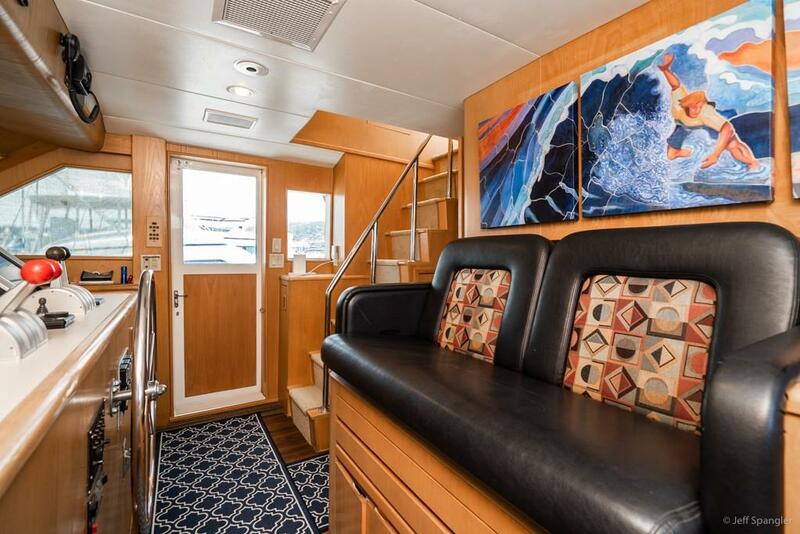 PRICE REDUCTION.....NOW $595,000.....WATCH VIDEO.....CALL This Hatteras 70 Sportdeck represents the evolution in design from the traditional Hatteras in this size with a modern, aft deck and curved, spiral staircase leading to a Euro style swim platform. 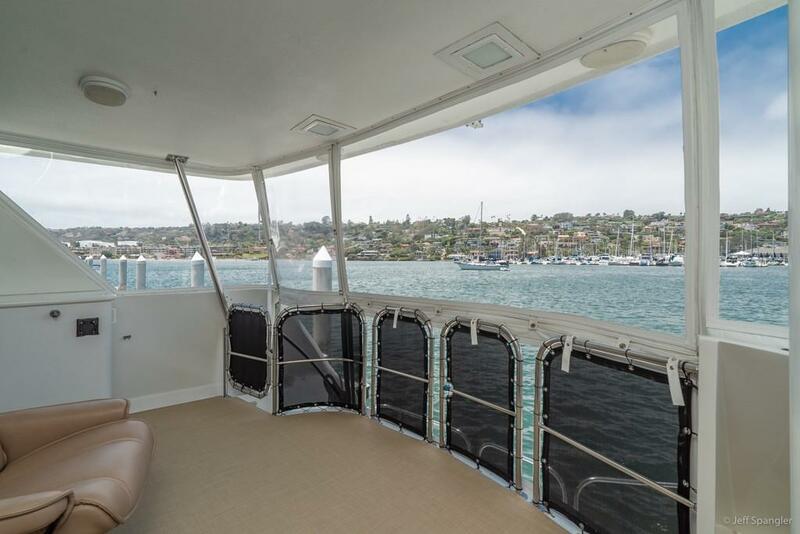 The aft deck provides an additional area for owners and guests to enjoy and the swim platform is easily accessible and useful for water activities. 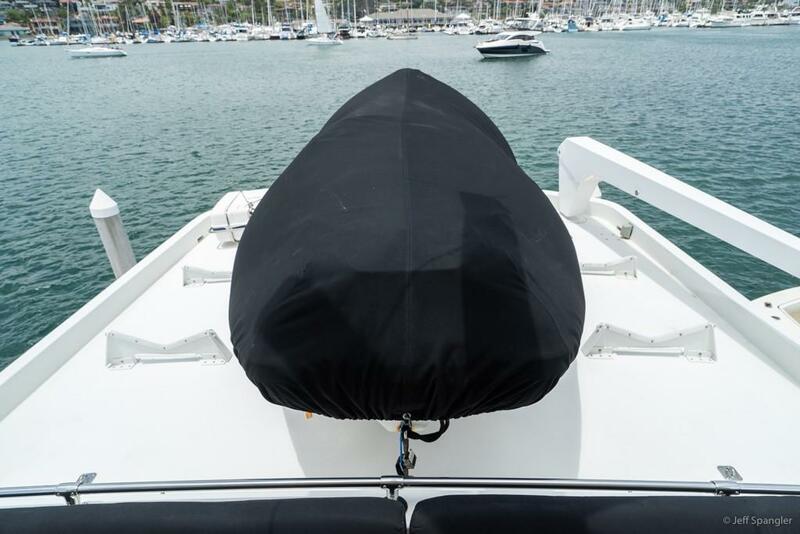 The 70 Sportdeck is aesthetically pleasing with a beautiful profile and her deep-v hull and sharp entry provide a safe, dry and comfortable motion when underway. 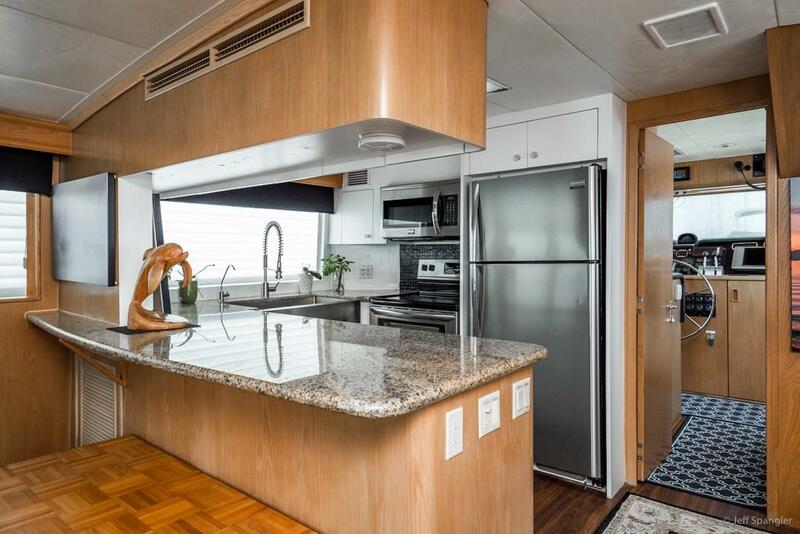 The current owners have made many improvements and upgrades. 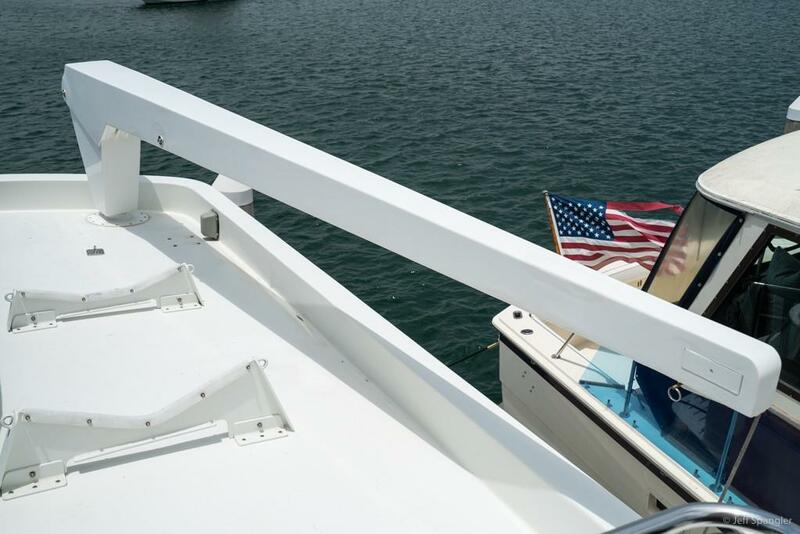 Some are subtle, some are minor and others are significant. 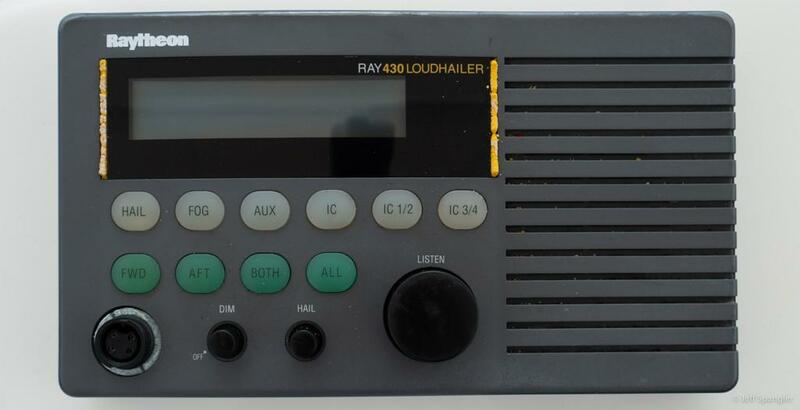 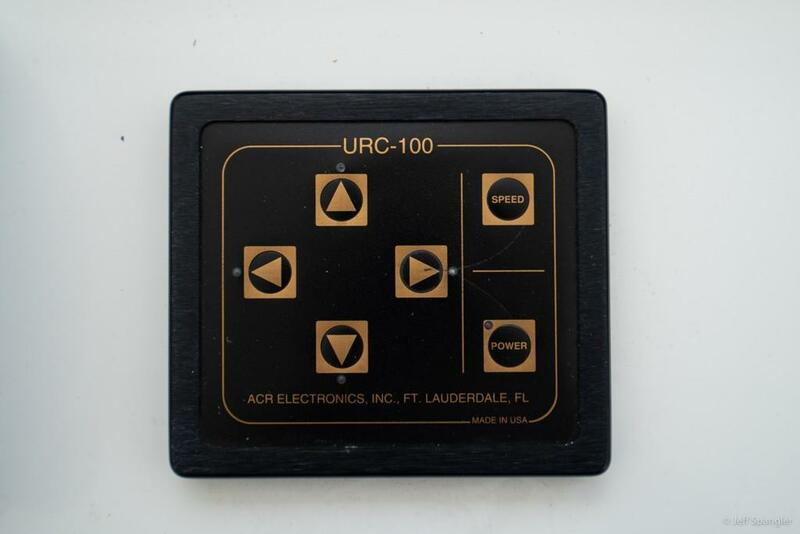 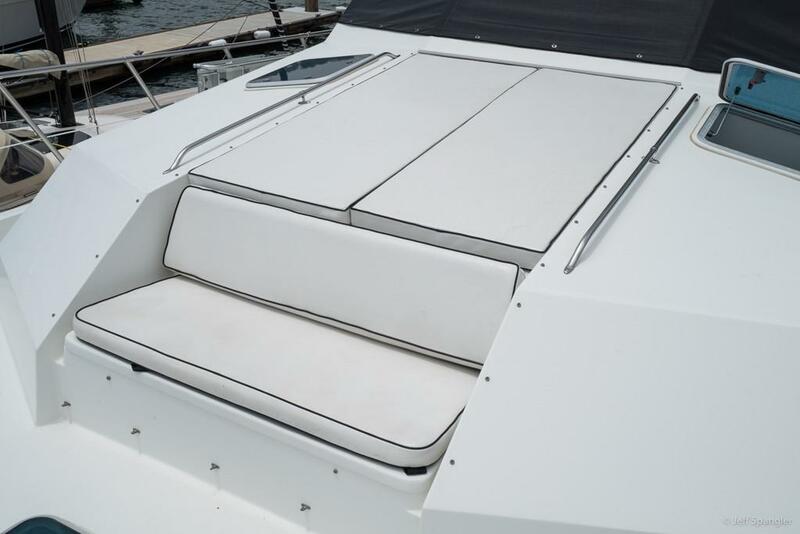 Many yachts in this size range have carpet throughout which deteriorates and must be replaced from time to time. 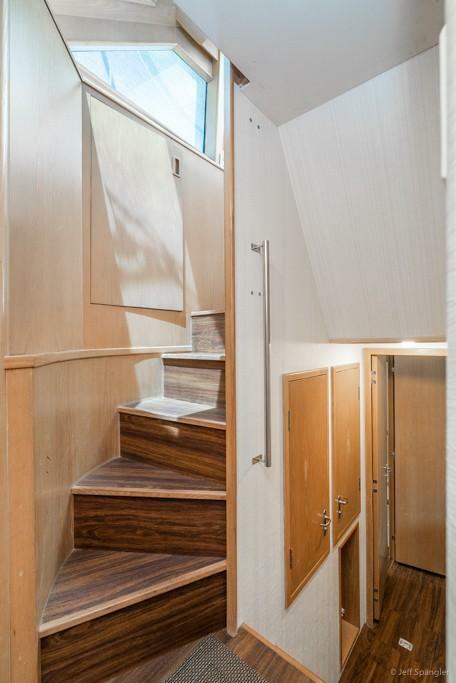 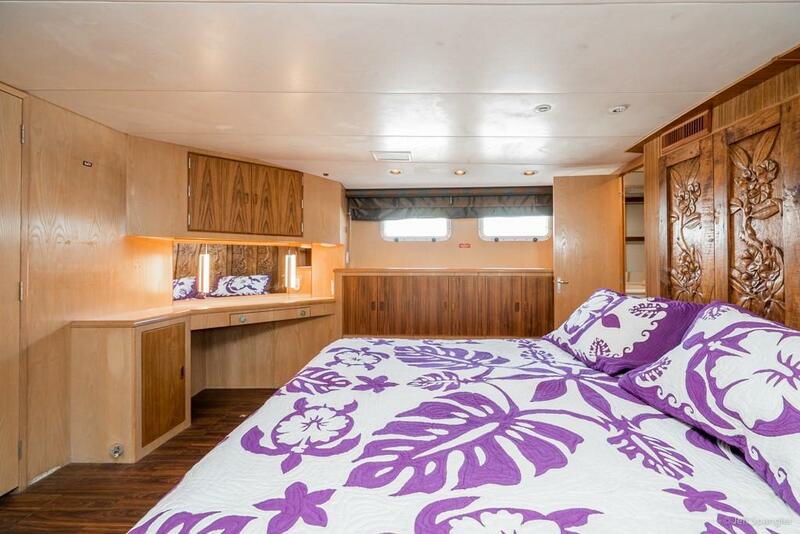 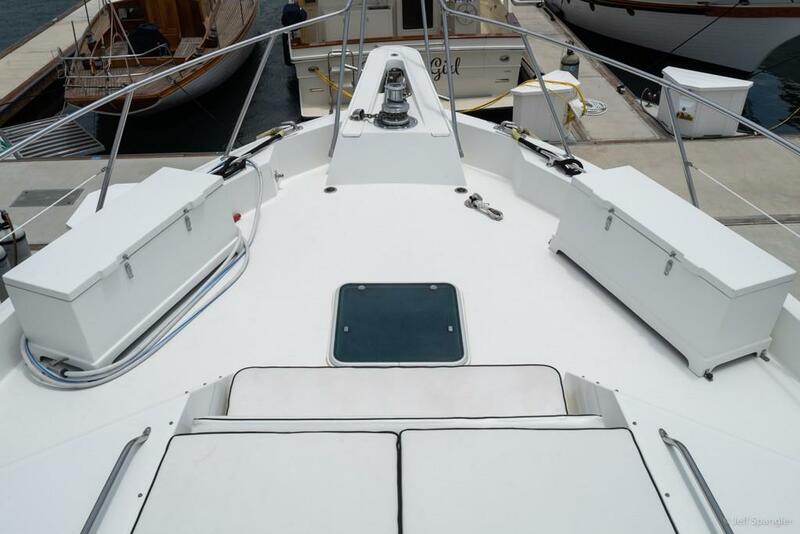 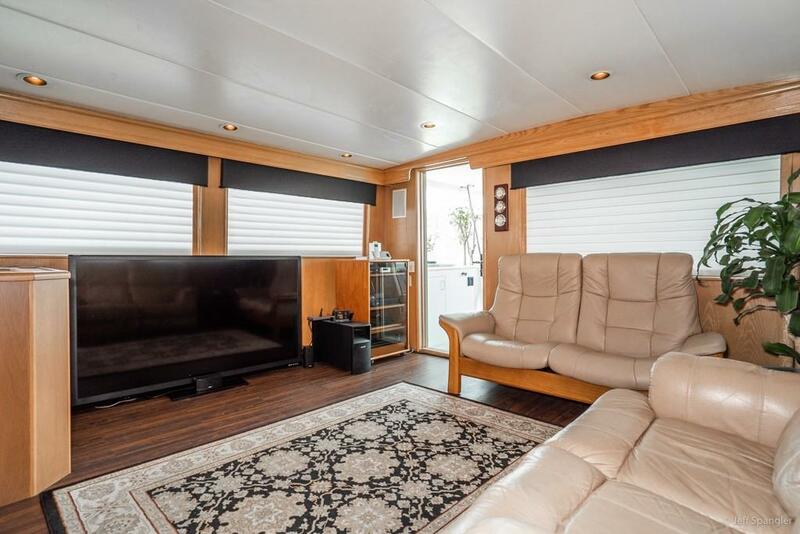 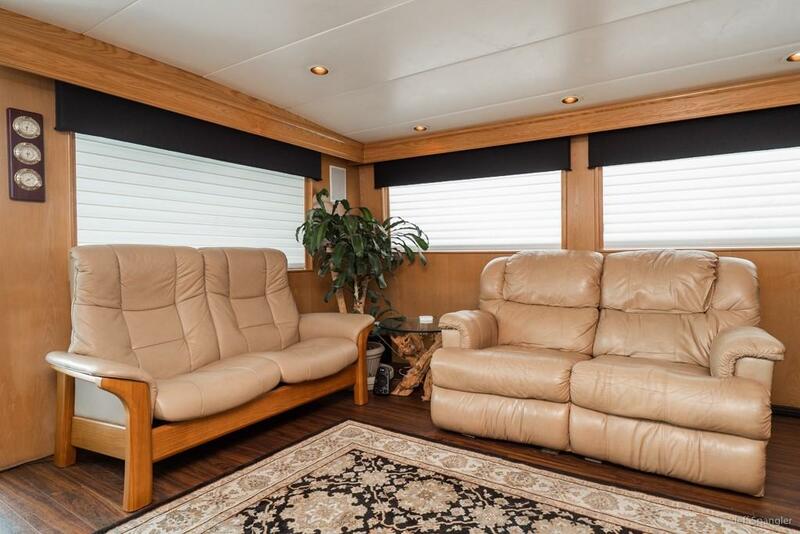 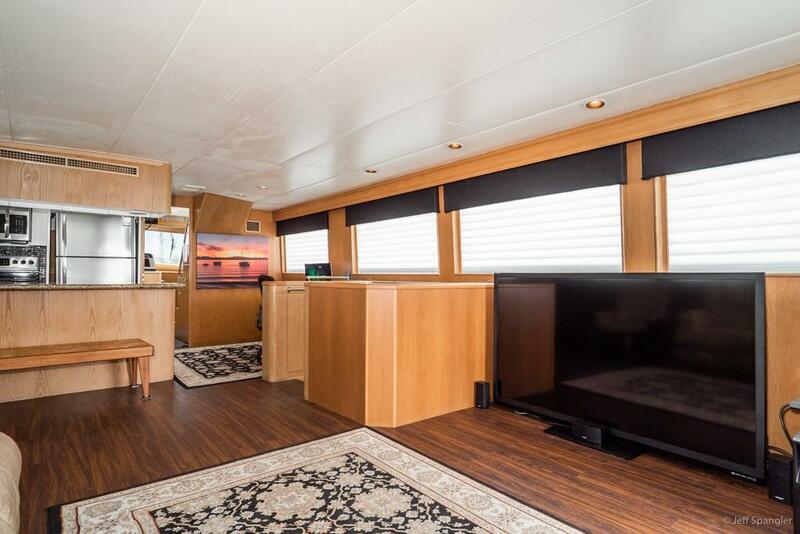 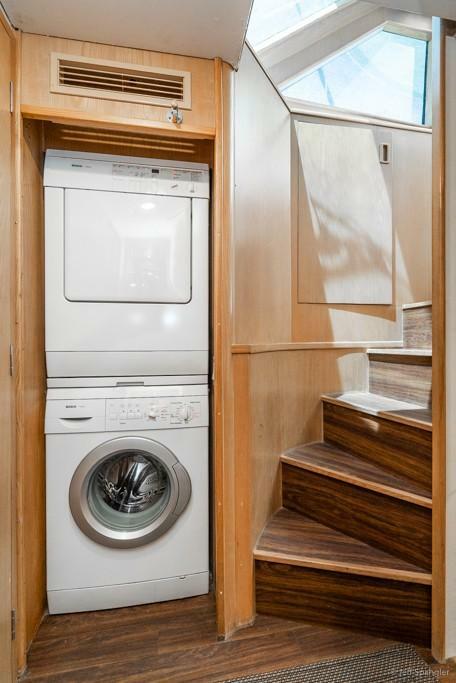 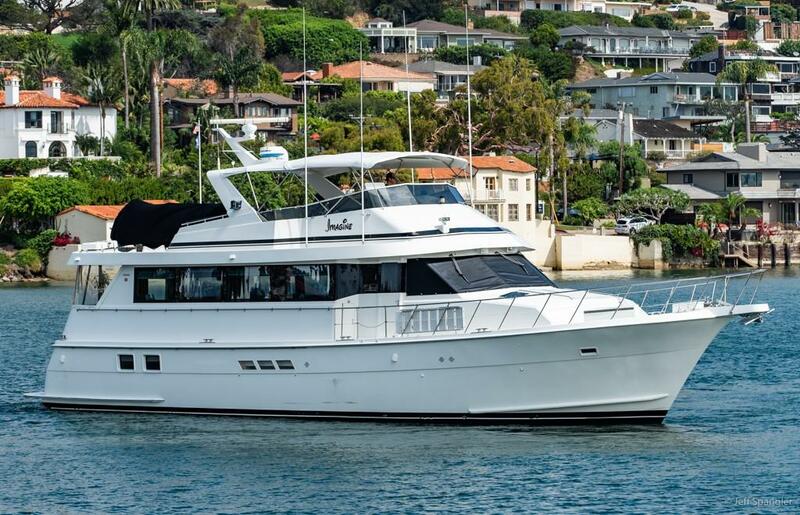 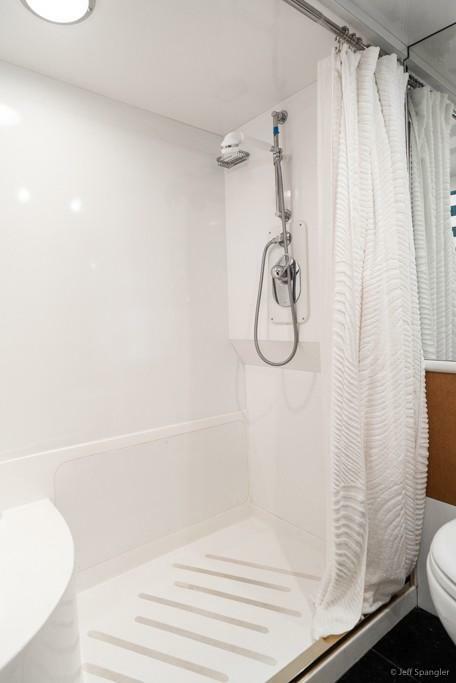 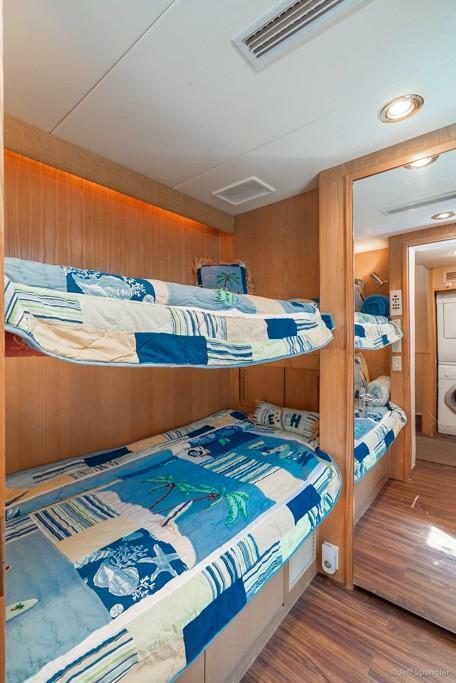 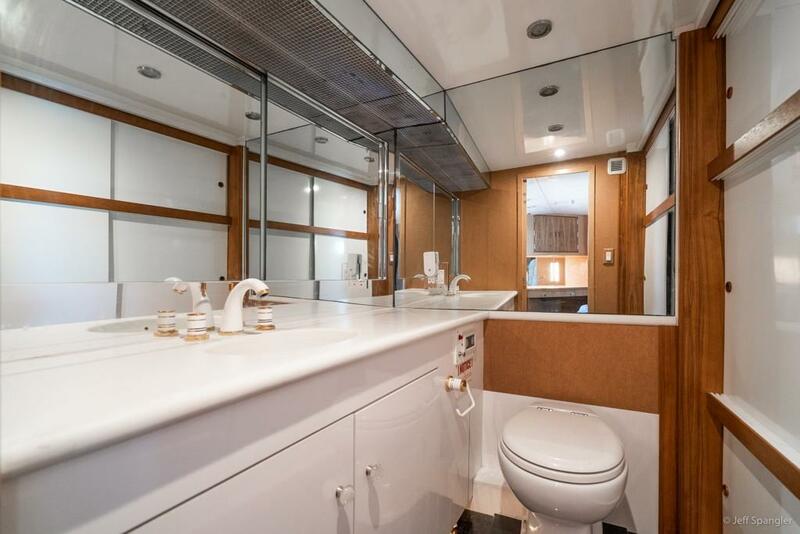 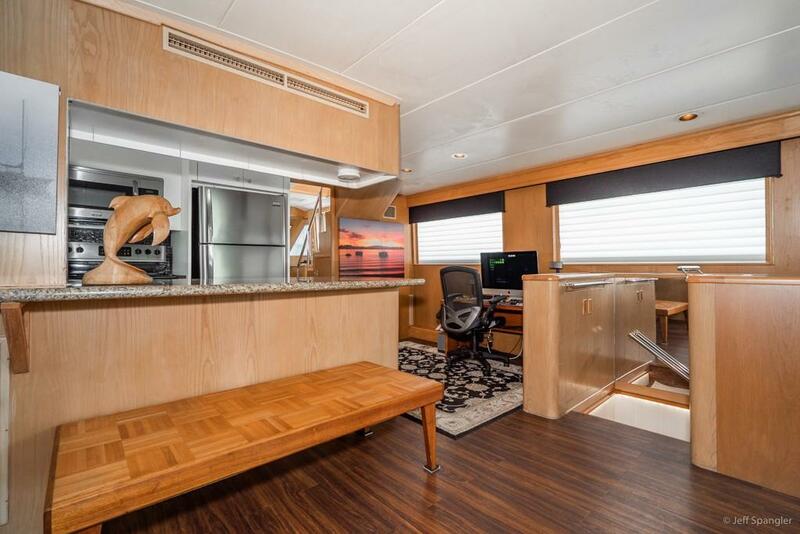 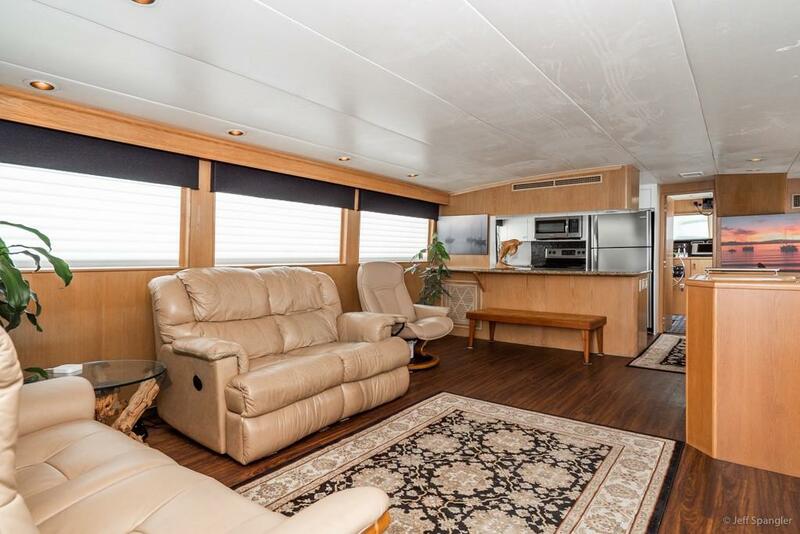 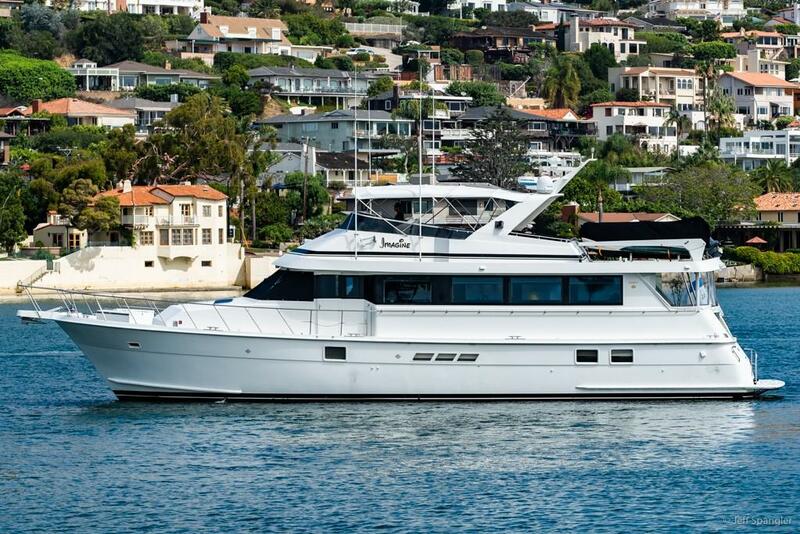 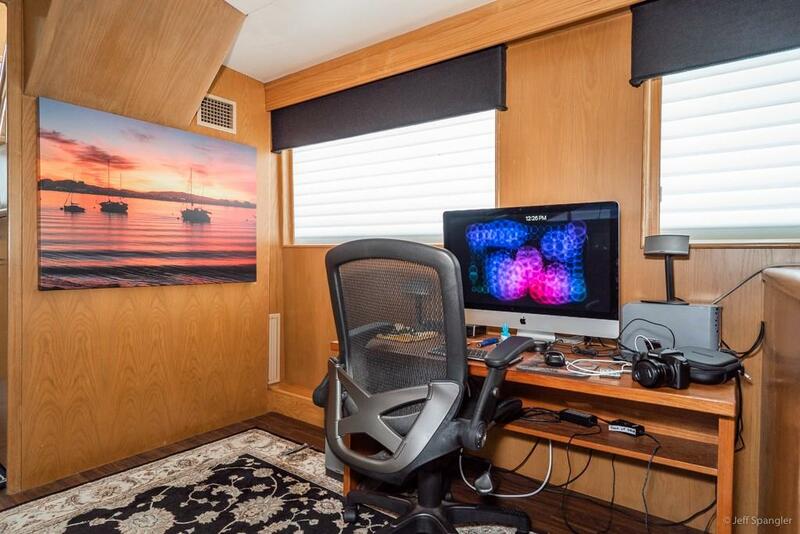 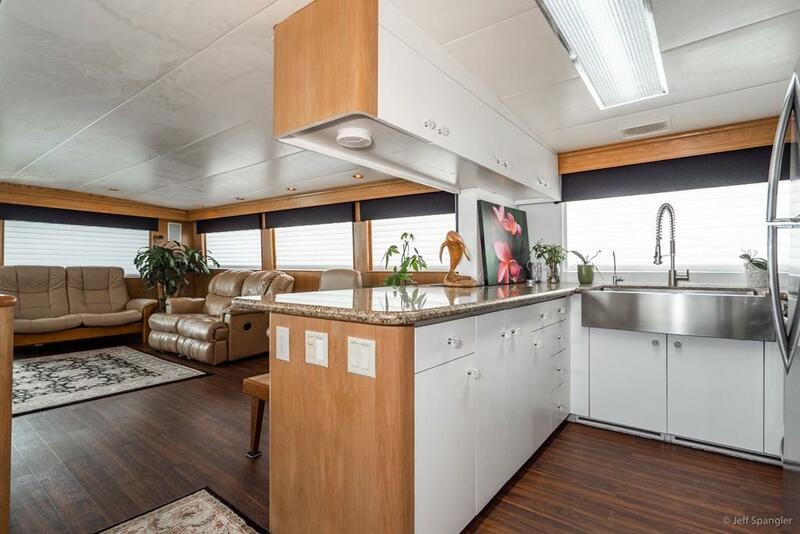 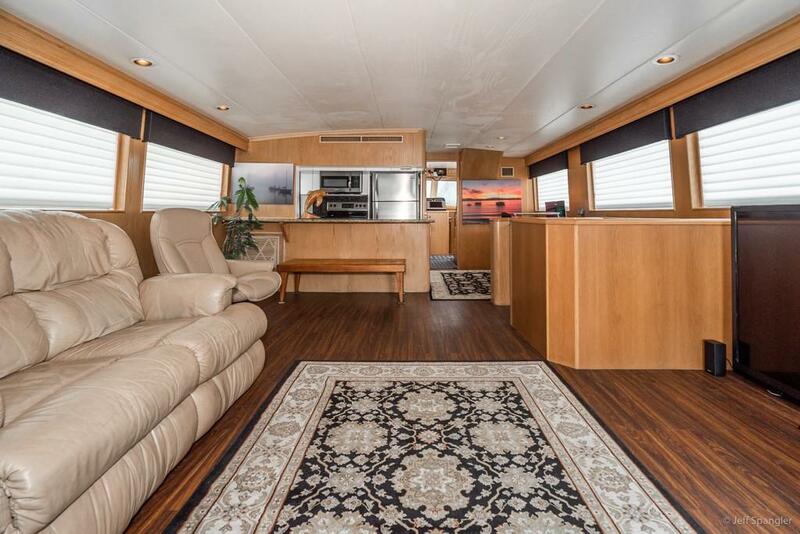 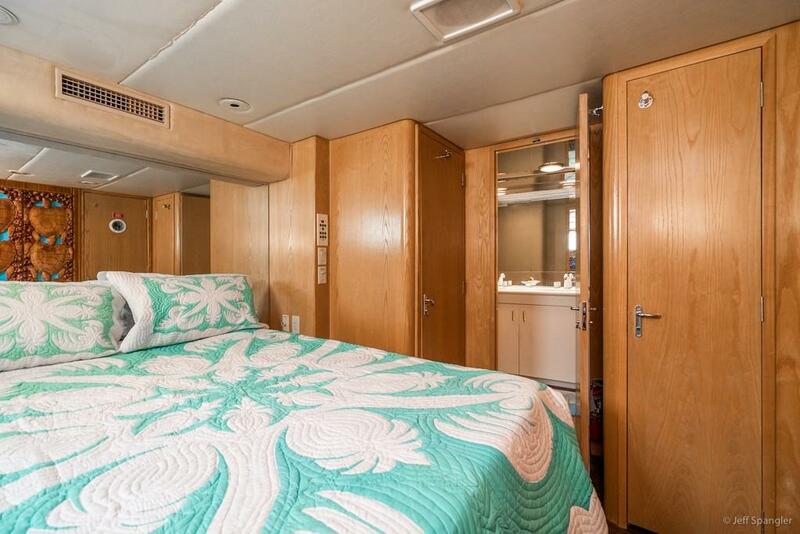 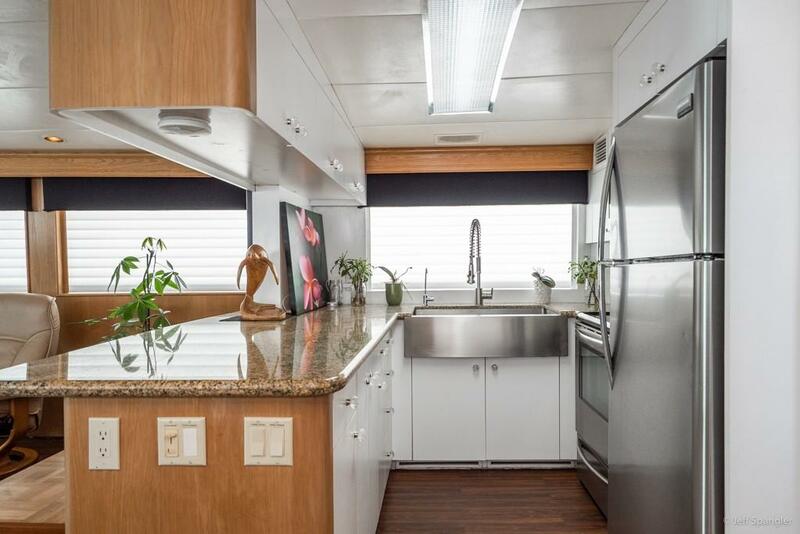 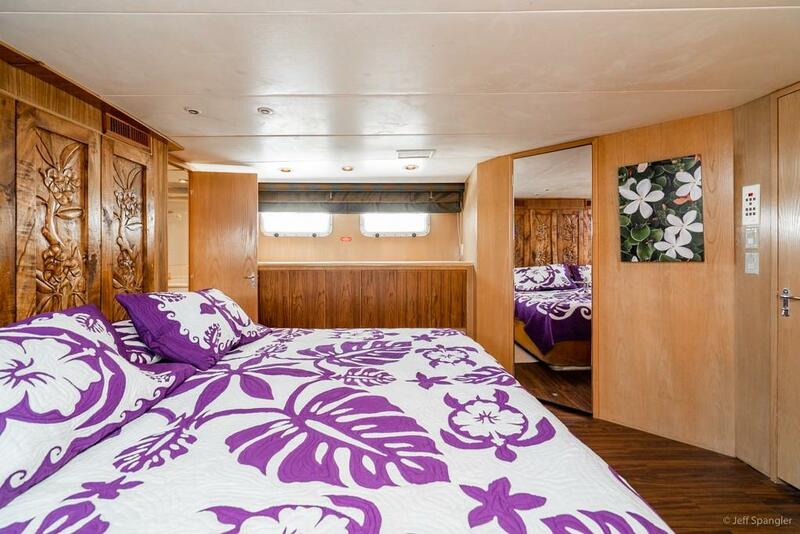 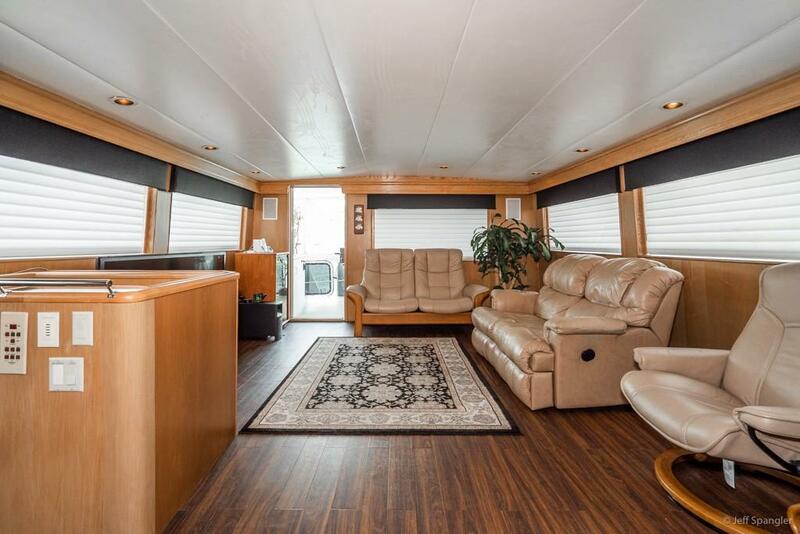 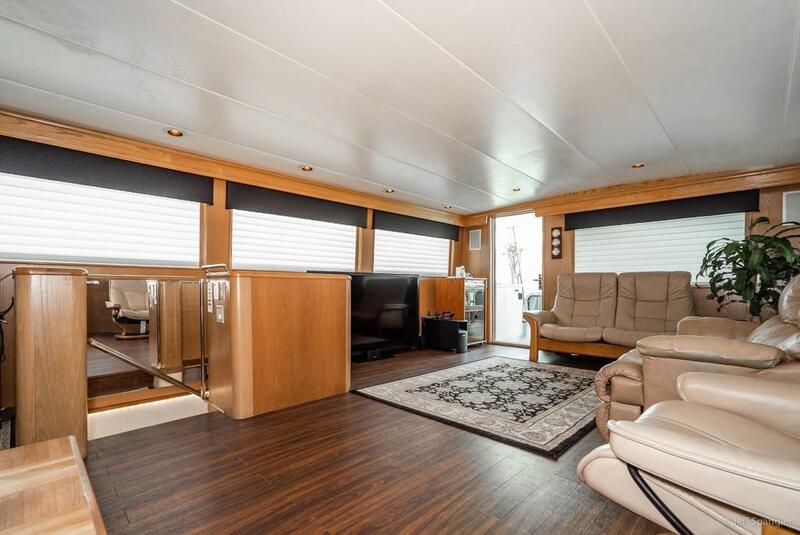 This Hatteras has all new "Amtico" flooring throughout. 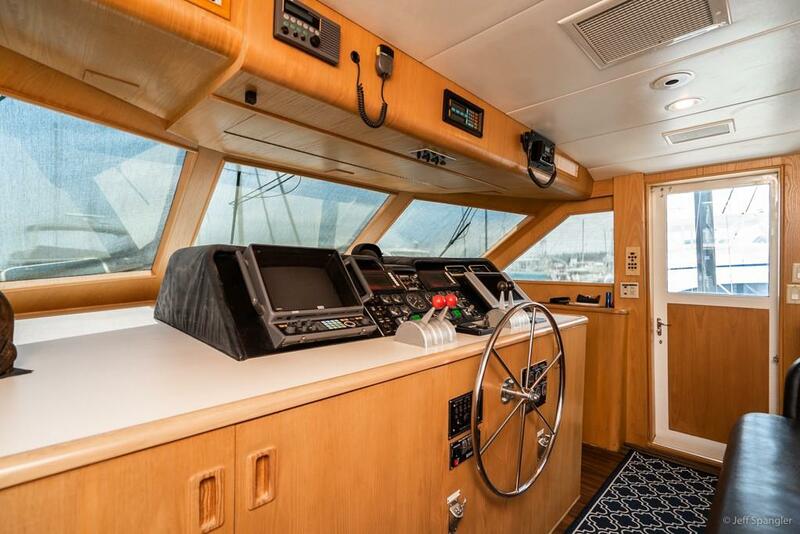 "Amtico" is found on many new yachts and is highly desirable. 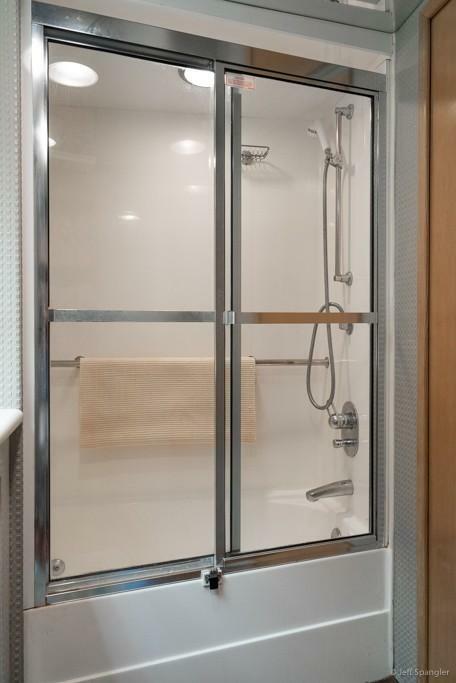 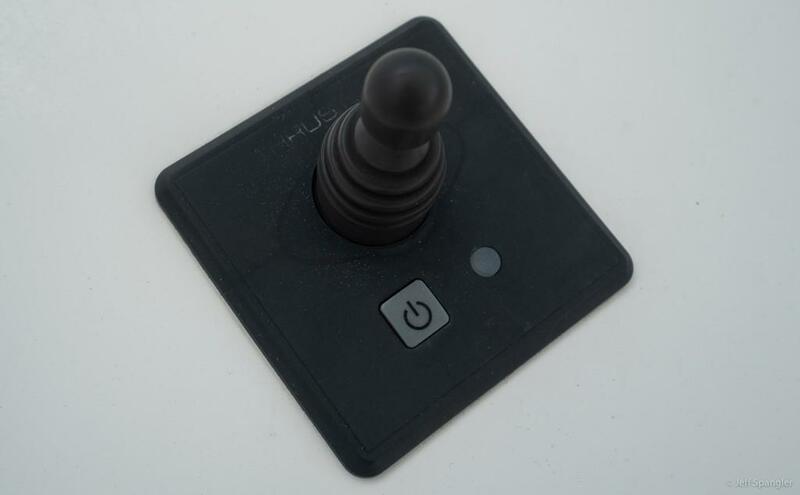 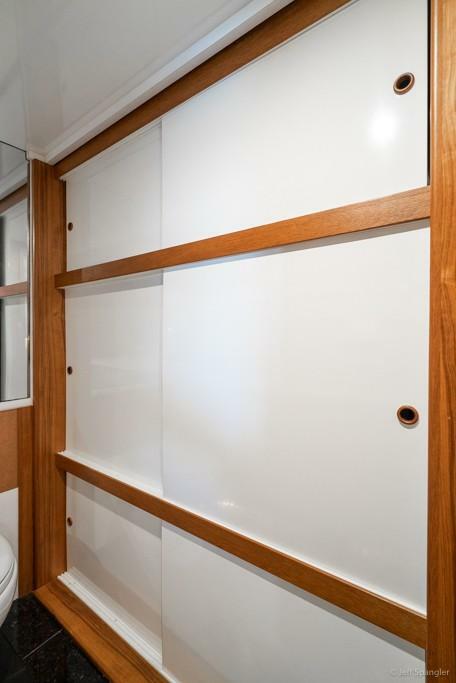 This modern, synthetic material is not only beautiful but will not degrade and, importantly, is hypoallergenic. 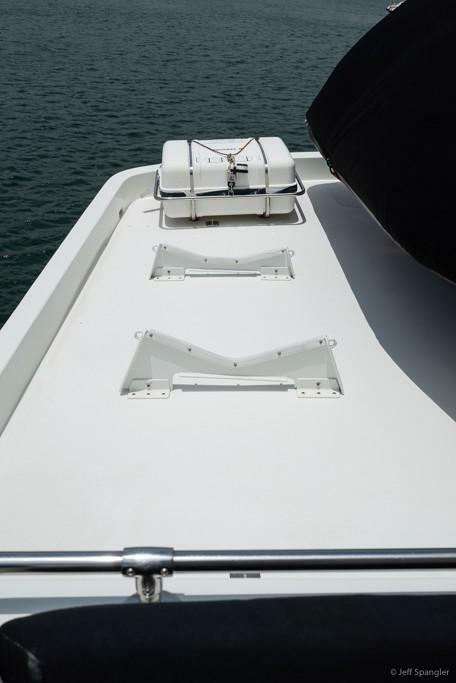 Another upgrade is the addition of new, reliable Tecma freshwater heads. 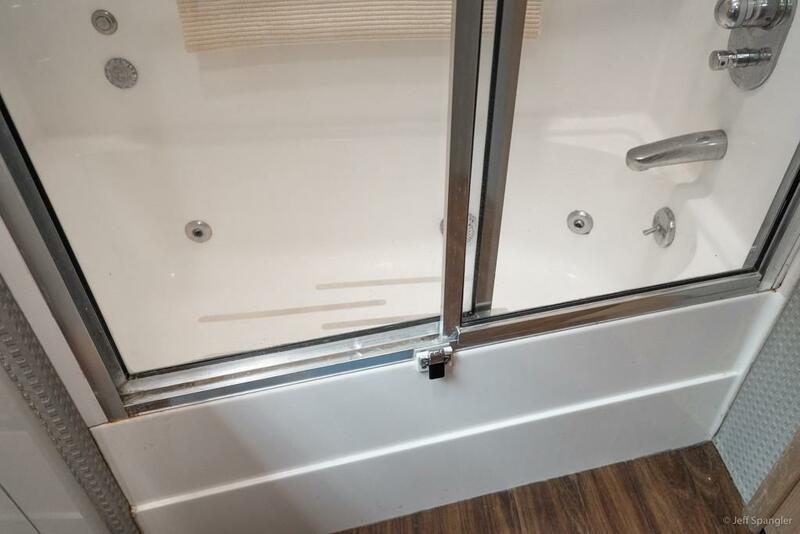 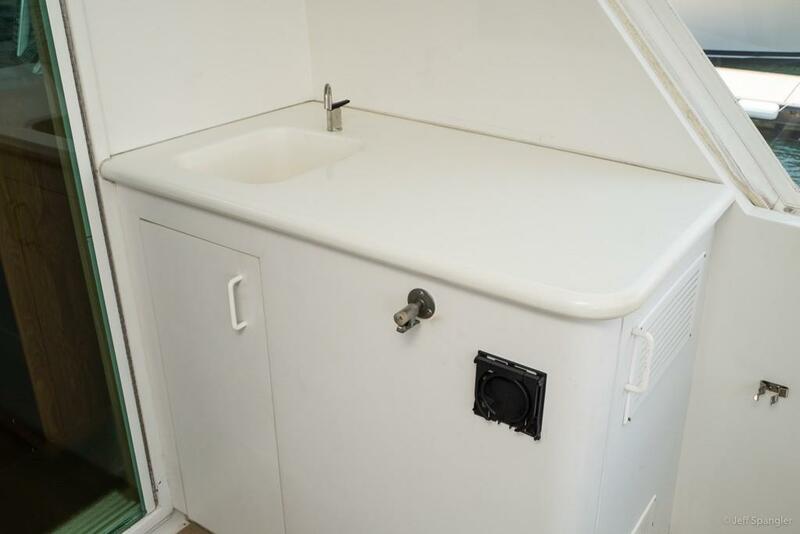 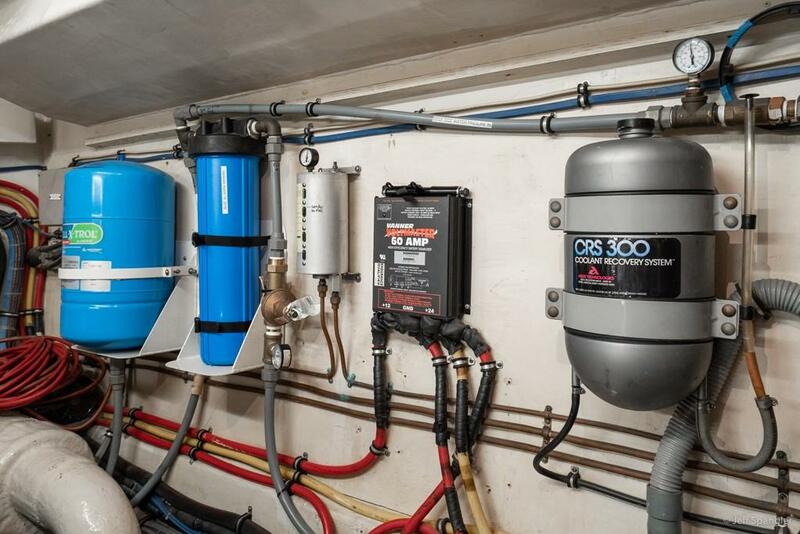 Older salt water electric heads create odors and can require replacement of both heads and plumbing. 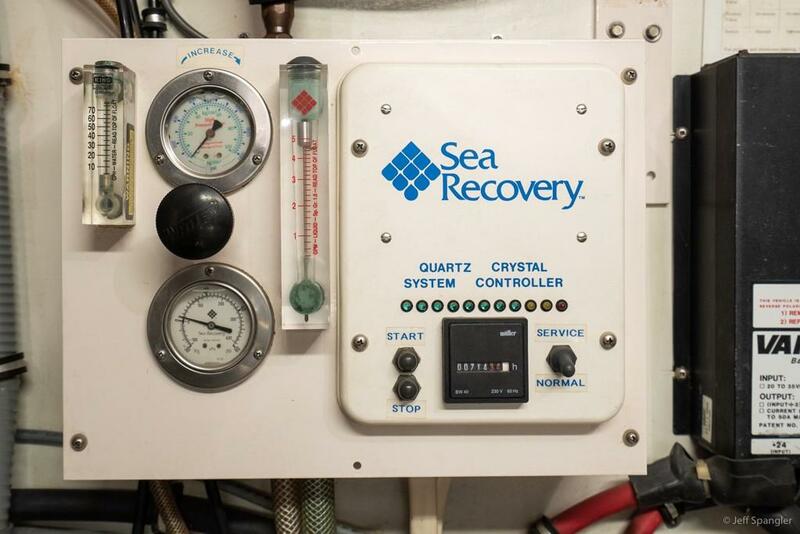 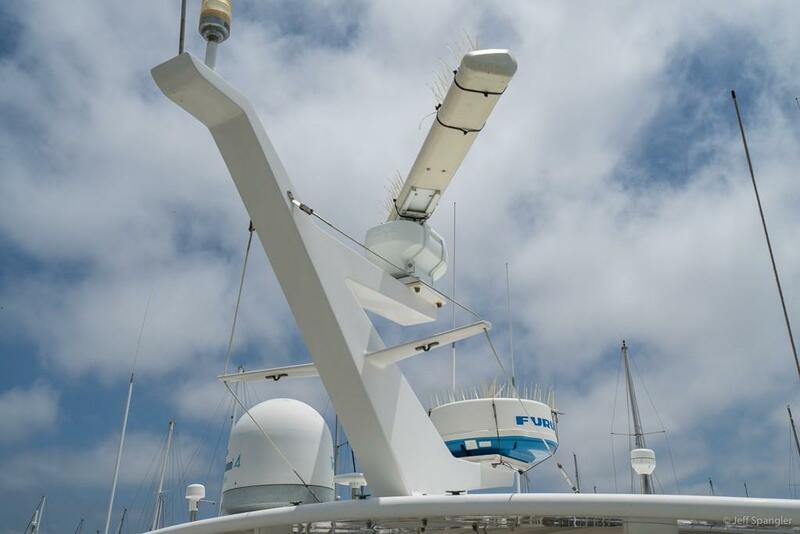 Tecma fresh water heads are standard equipment on many new yachts and are an important upgrade on this Hatteras. 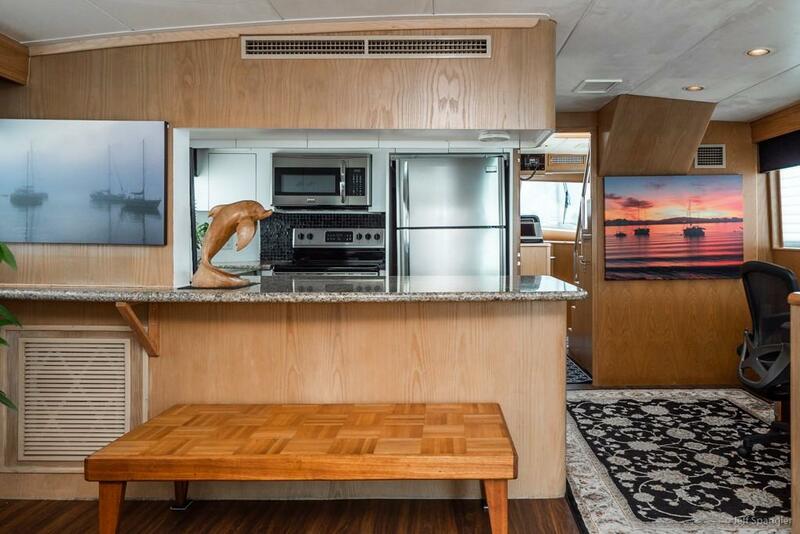 The full beam Main Salon is massive and open to the forward Gourmet Galley so no one is isolated when preparing meals. 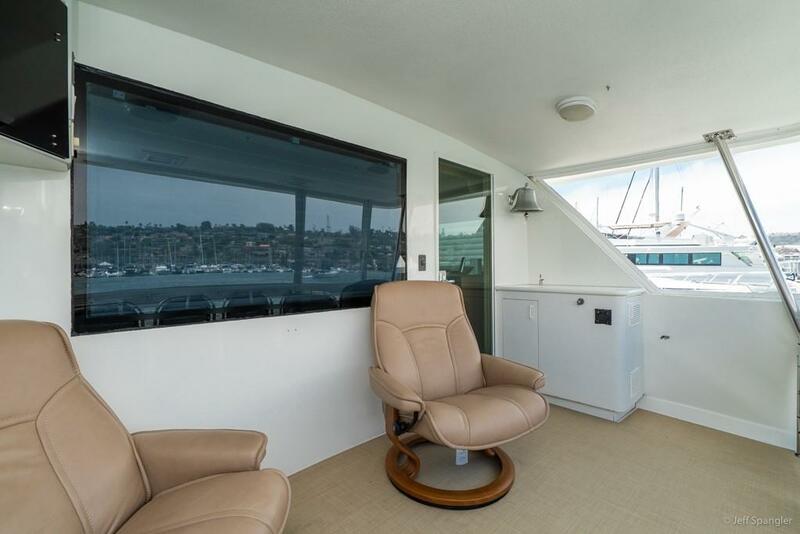 Large windows surround the Salon and provide a bright area with the feeling of space and volume. 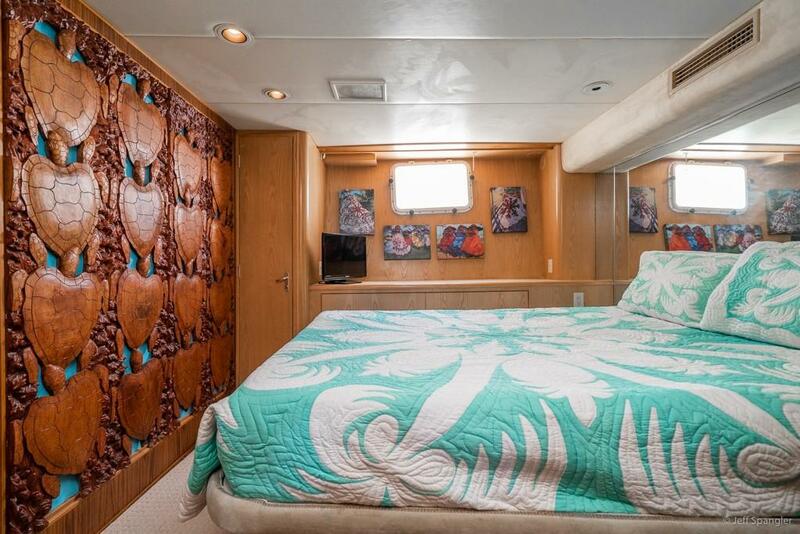 The Master Stateroom has private access from the Salon and features a King Size bed with an exotic, carved hardwood Headboard. 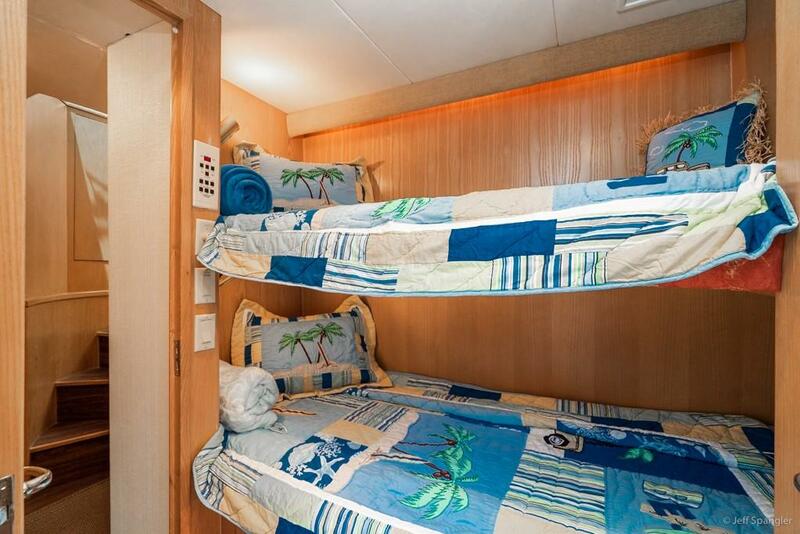 His and Hers Heads complete this warm and inviting stateroom. 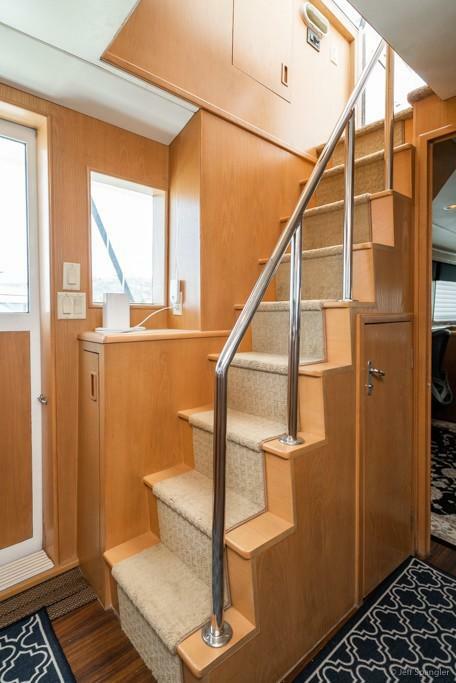 Guest Staterooms are accessed from the stairwell in the Pilothouse. 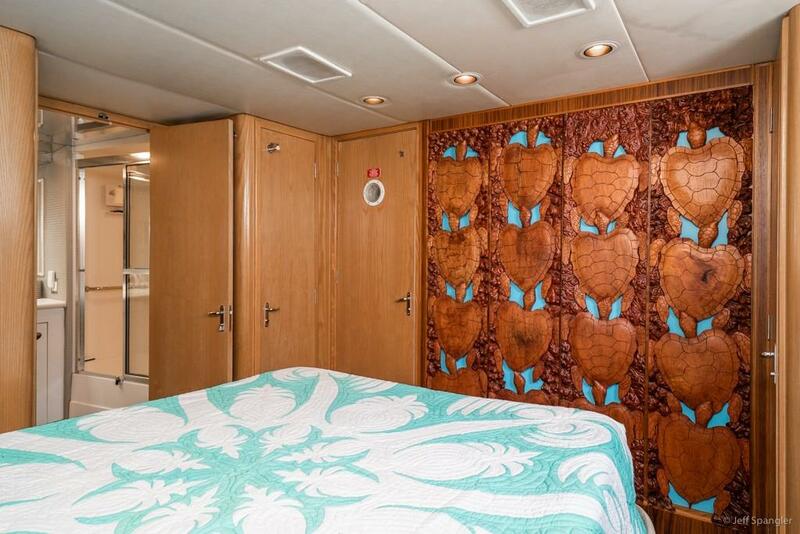 The VIP Stateroom features a Queen size walk around bed with unique Turtle Screen wall and an ensuite head. 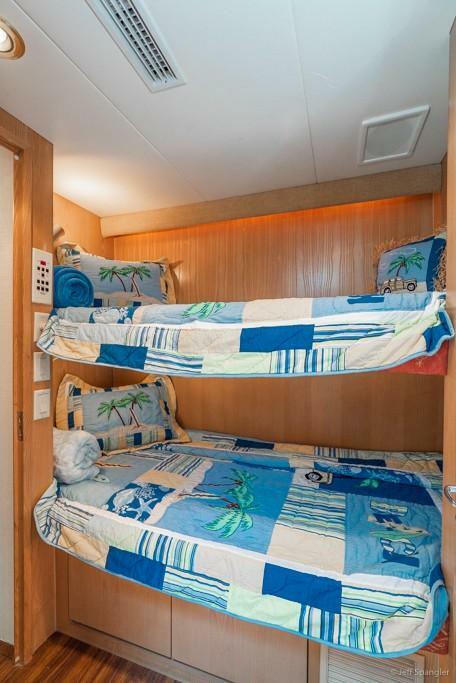 There is another stateroom with over/under berths and the forward stateroom has been converted into an Artist Studio. 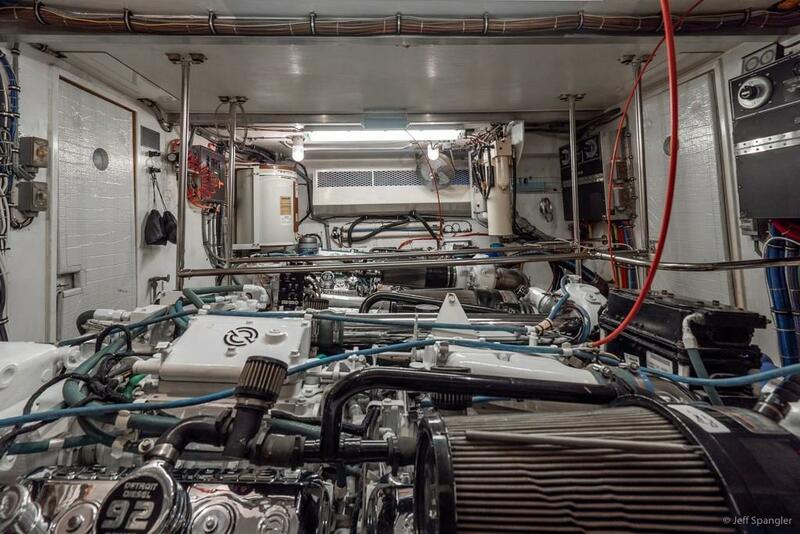 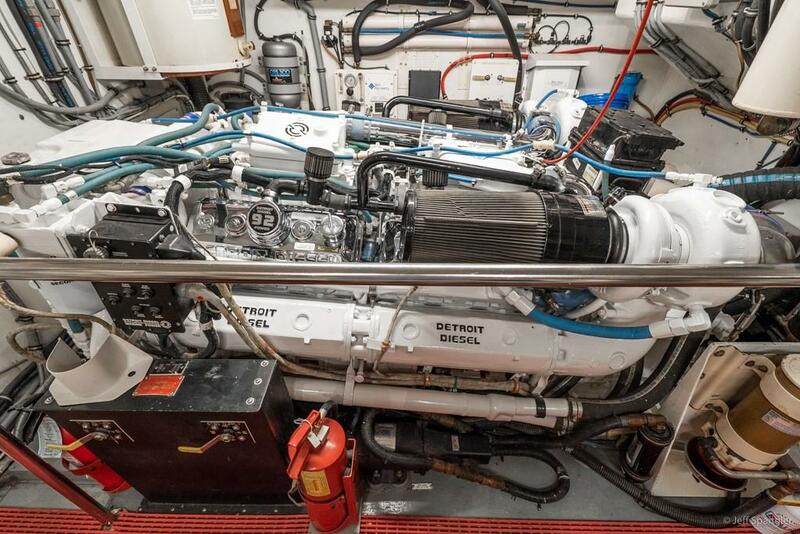 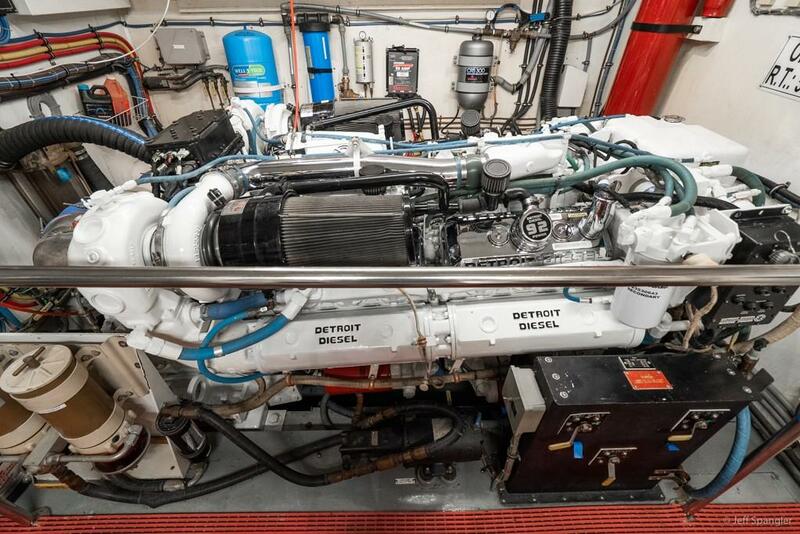 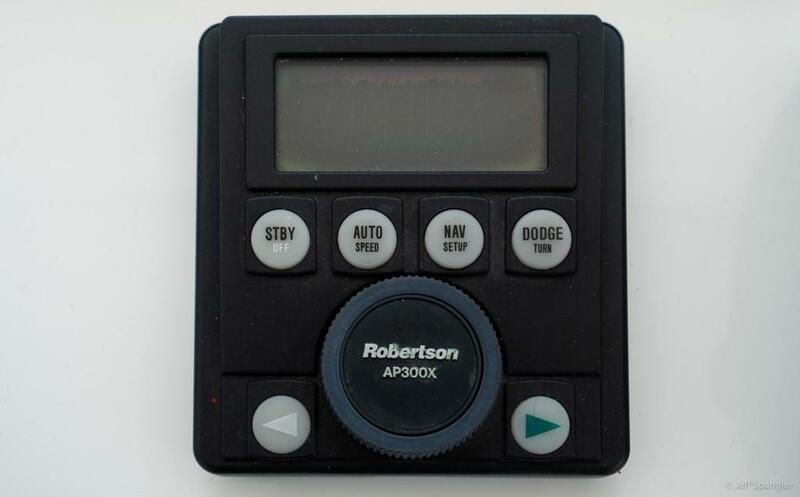 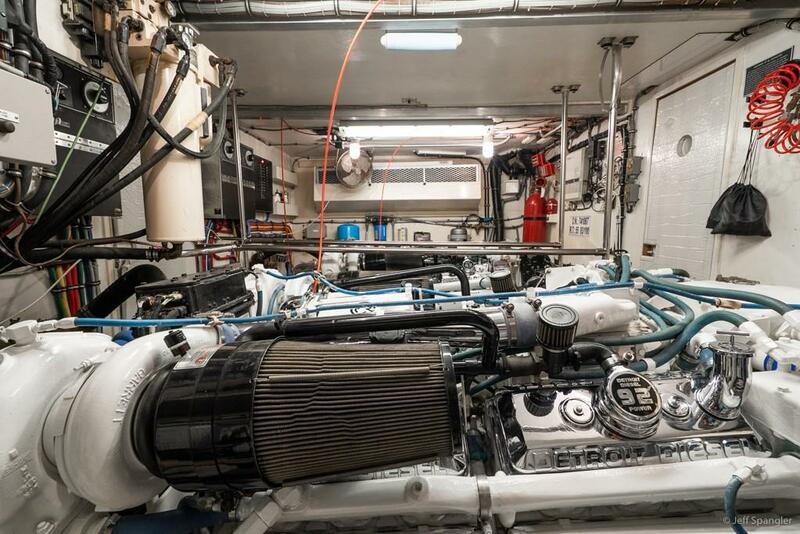 Other important features include Detroit Diesel DDEC's, two Generators, Naiad Stabilizers, Bow Thruster and air conditioning throughout. 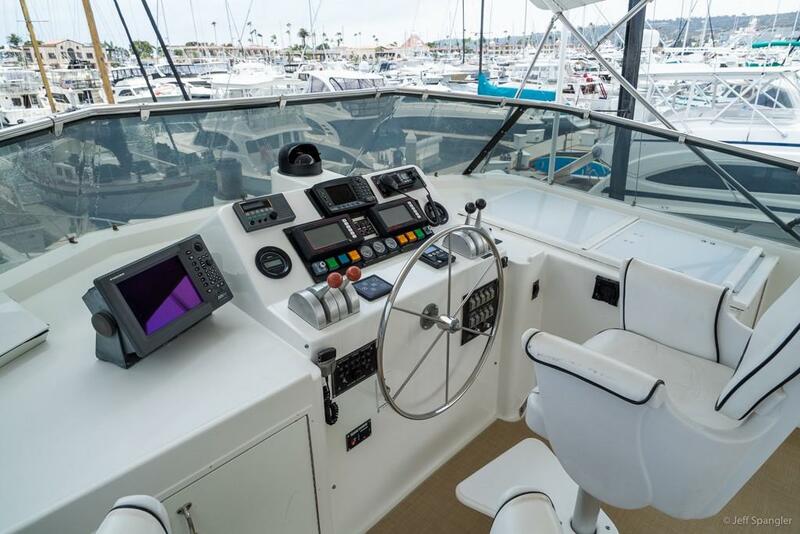 The Flybridge Deck seats 10 and has two Helm Seats and complete controls. 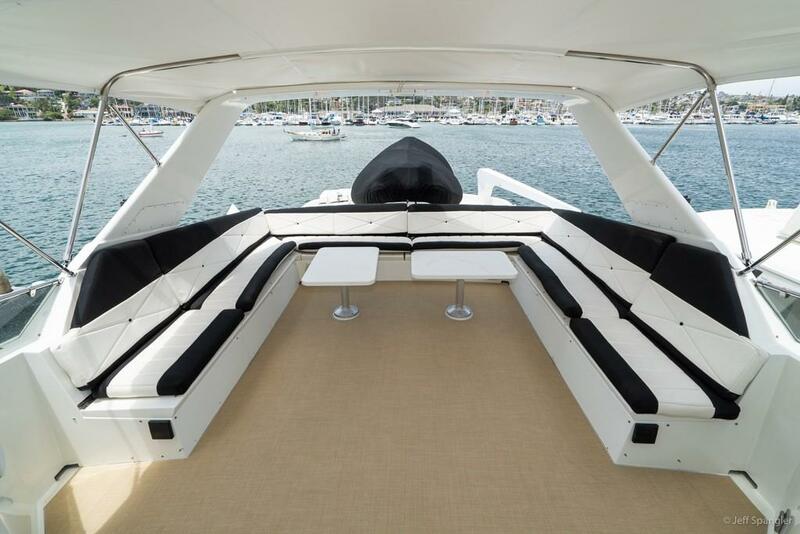 At the aft end of the Flybridge Deck is a 2011 AB 13 DLX tender with Yamaha 60. 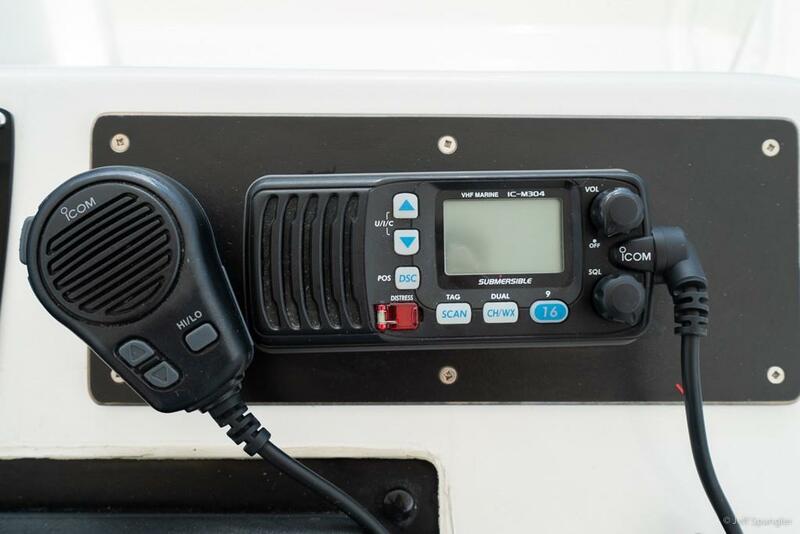 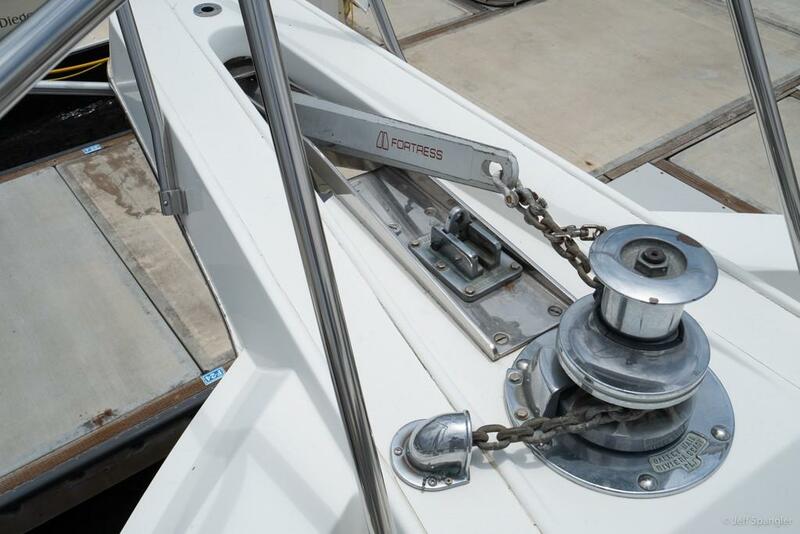 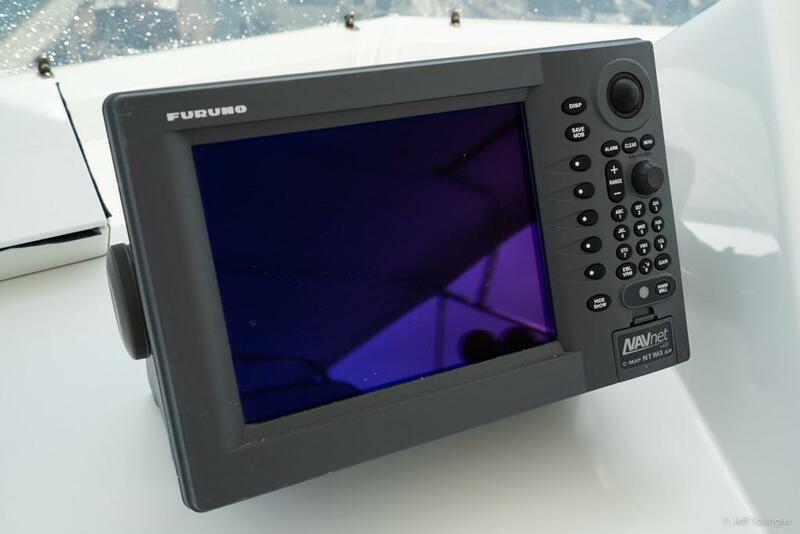 This tender is "like-new" and is launched with the Marquipt Davit. 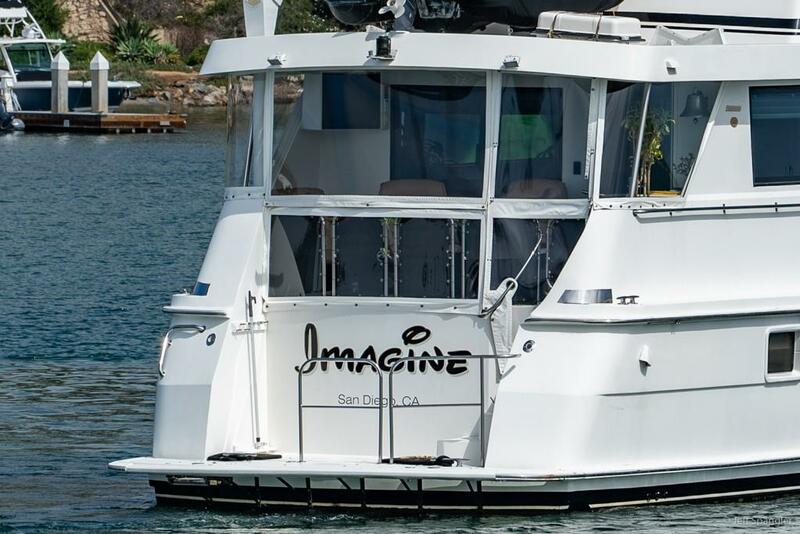 "Imagine" is competitively priced and......is owned in an LLC! 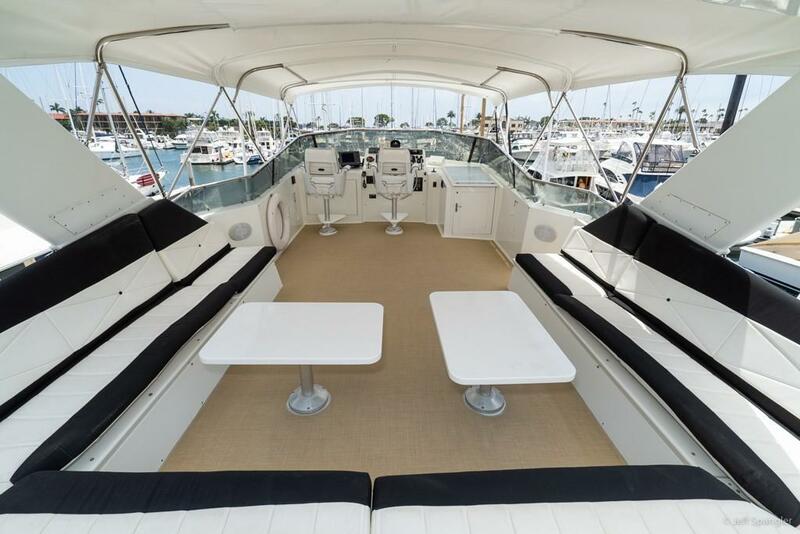 The Hatteras 70 Sportdeck was introduced with the new European style transom with large swim platform and curved spiral staircase leading to the spacious aft deck which takes advantage of the full beam and is 8' in length. 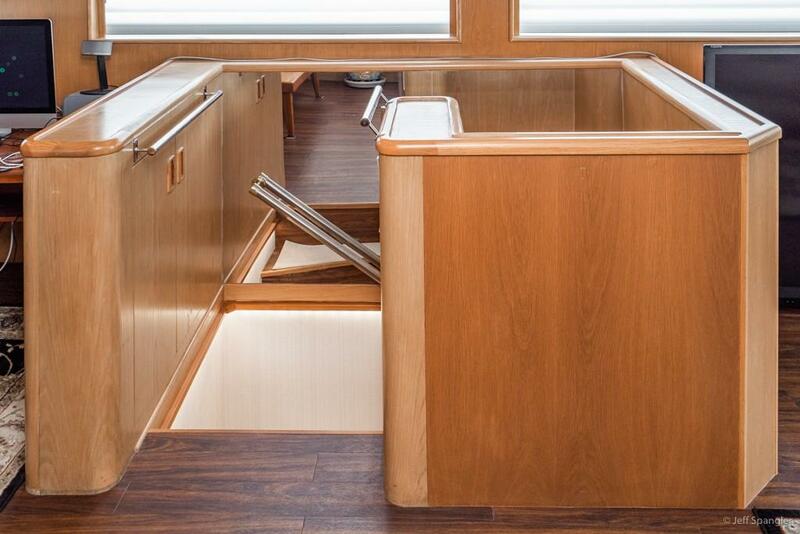 The aft deck provides an additional space for owners and guests and is enclosed with clear, removable panels. 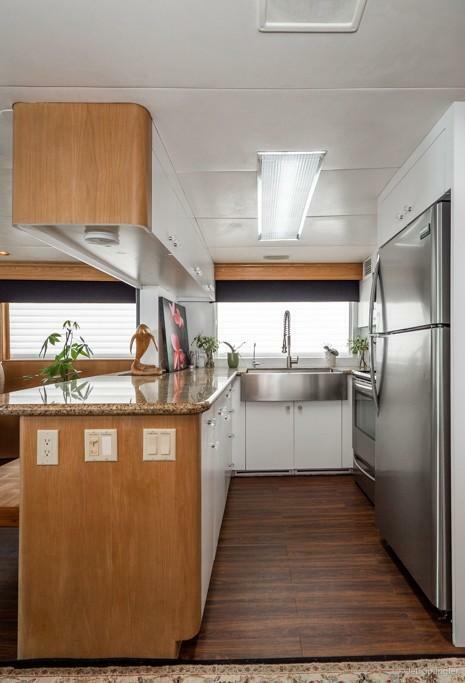 There is plenty of room for table and chairs. 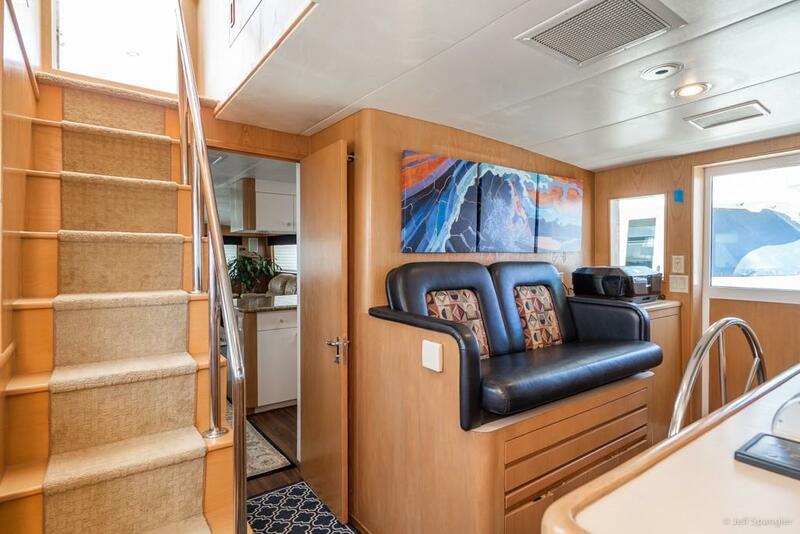 The Main Salon is entered from the aft deck and is massive with private stairwell to the aft Master Stateroom which features a King Size centerline walk-around bed. 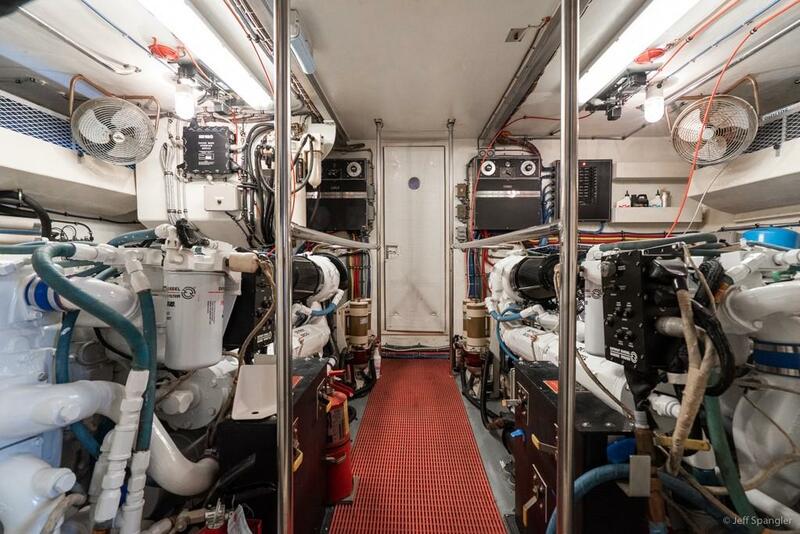 The Master has His and Hers heads! 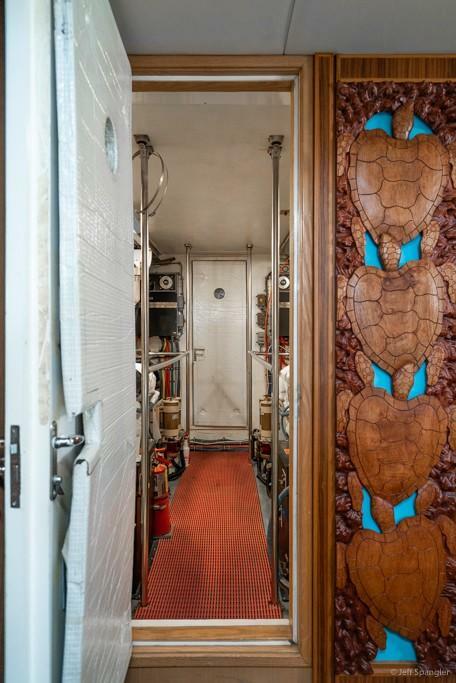 Forward of the Main salon is the open "on-deck" Gourmet Galley. 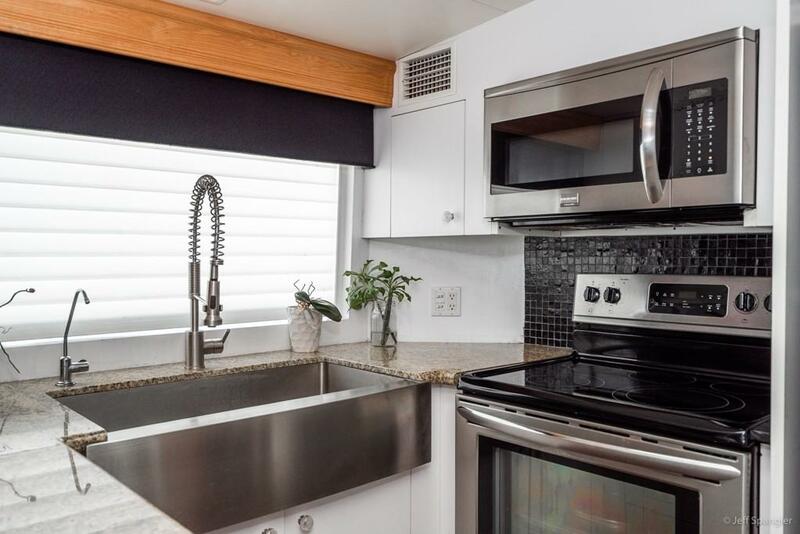 The Galley is open to the Salon eliminating isolation when preparing meals. 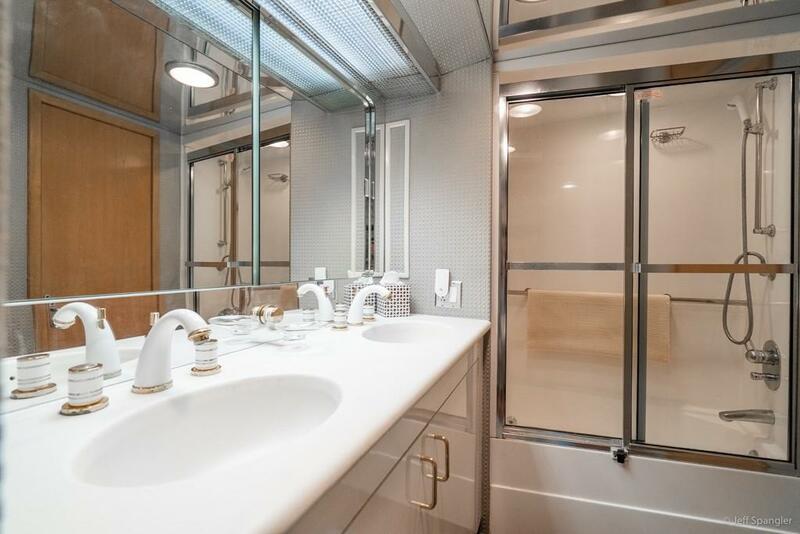 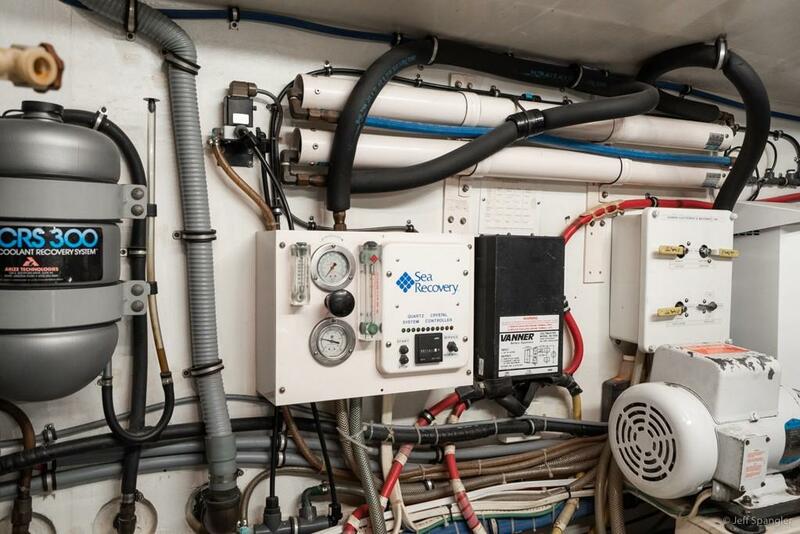 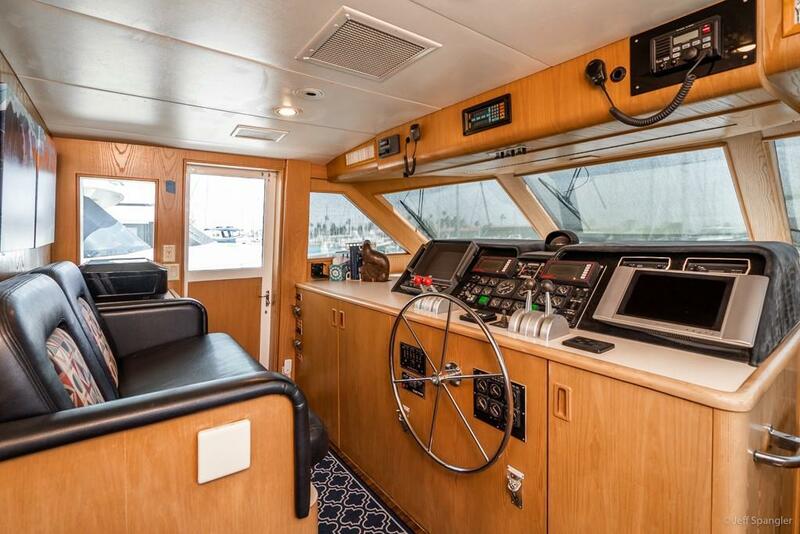 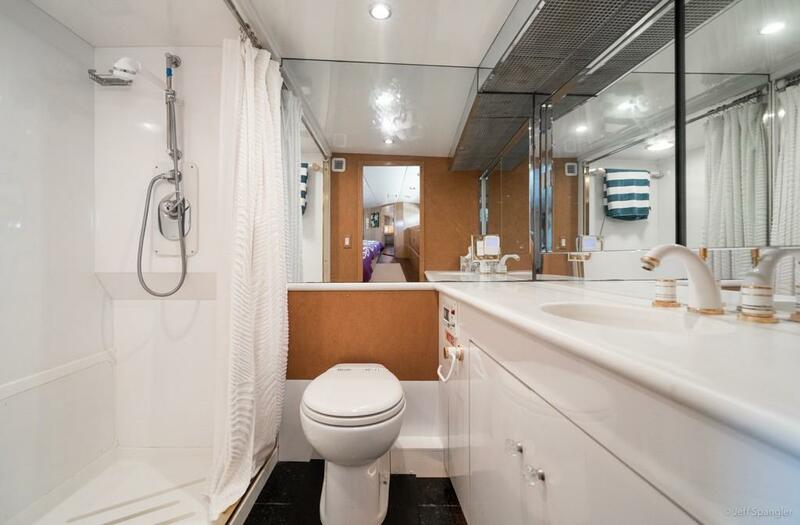 Moving forward from the Galley is the Pilothouse with port and starboard doors, full engine controls, electronics and a stairwell leading to the below deck staterooms. 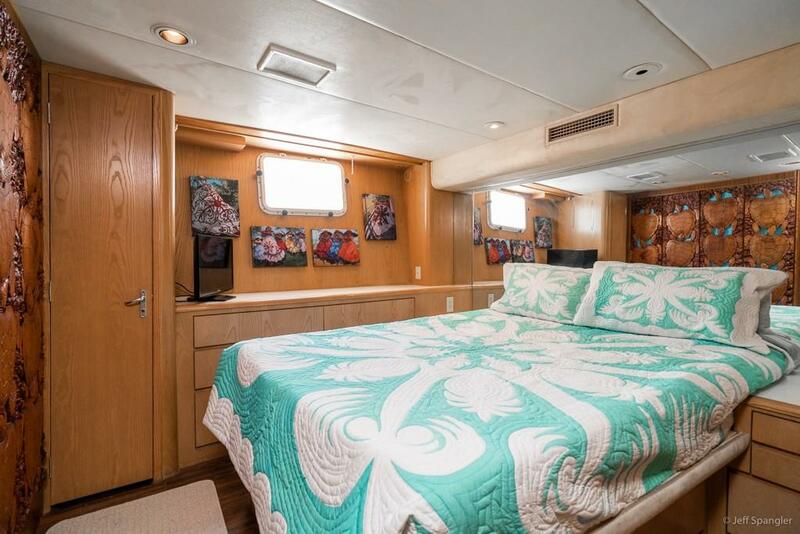 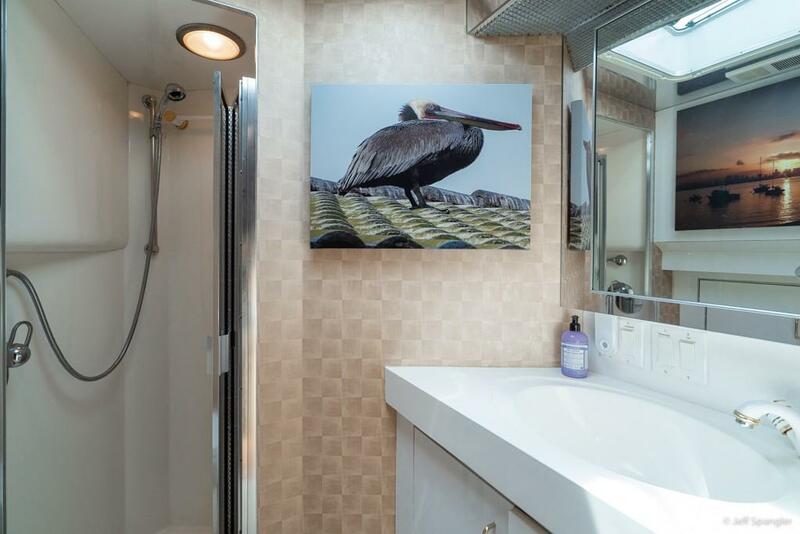 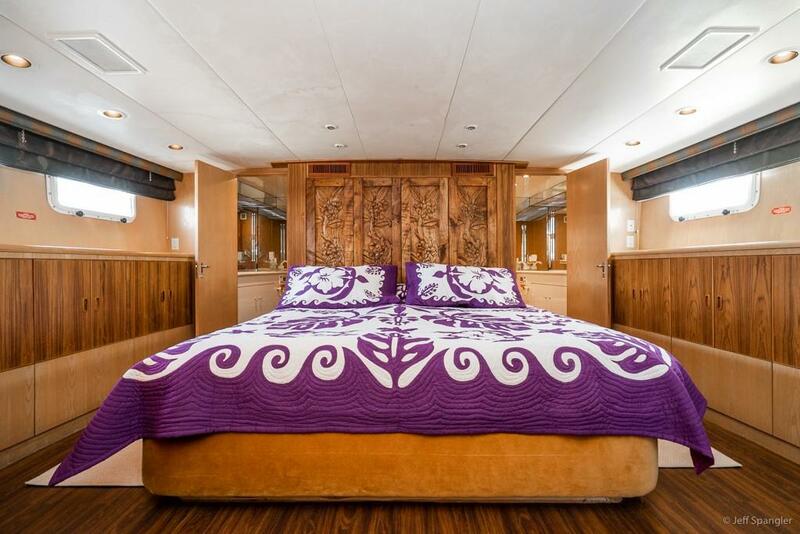 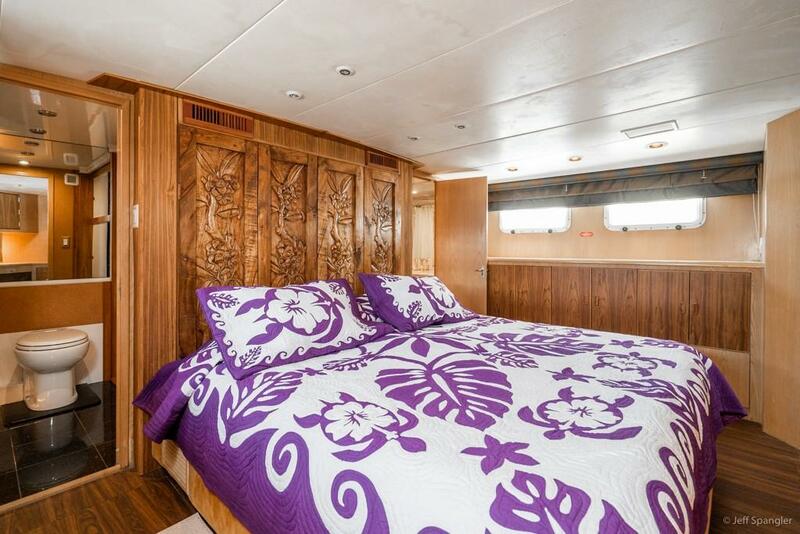 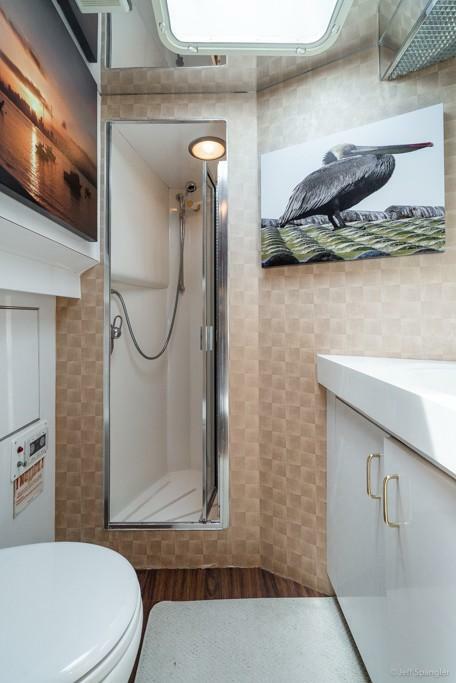 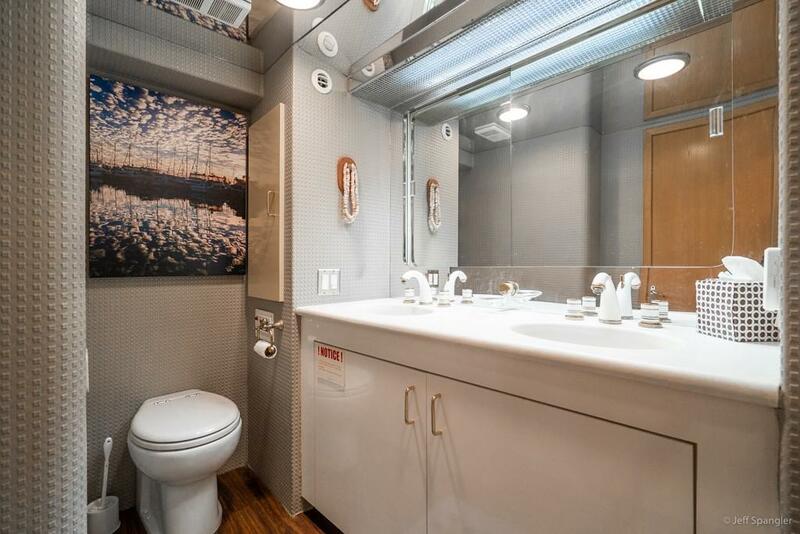 Below deck forward is a large VIP Stateroom with centerline Queen bed and ensuite head, a Guest Stateroom with upper and lowers berths and the most forward stateroom has been converted into an Art Studio. 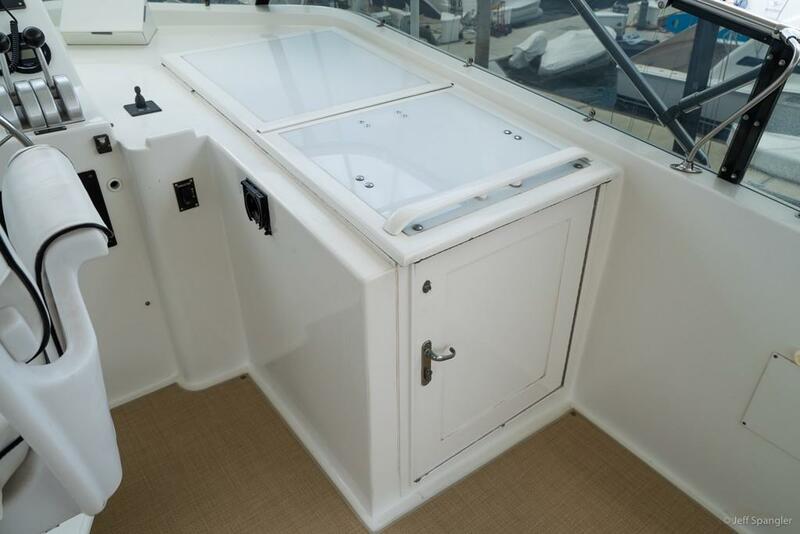 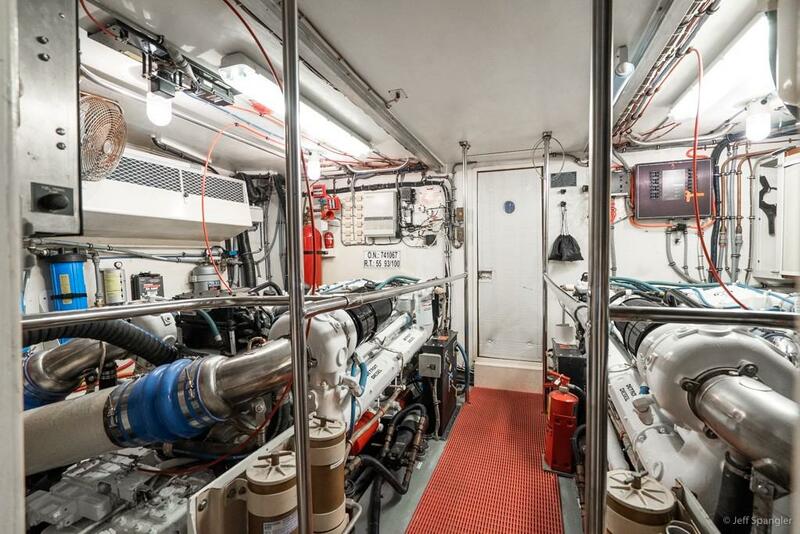 Engine Room access is entered from fore and aft doors below deck. 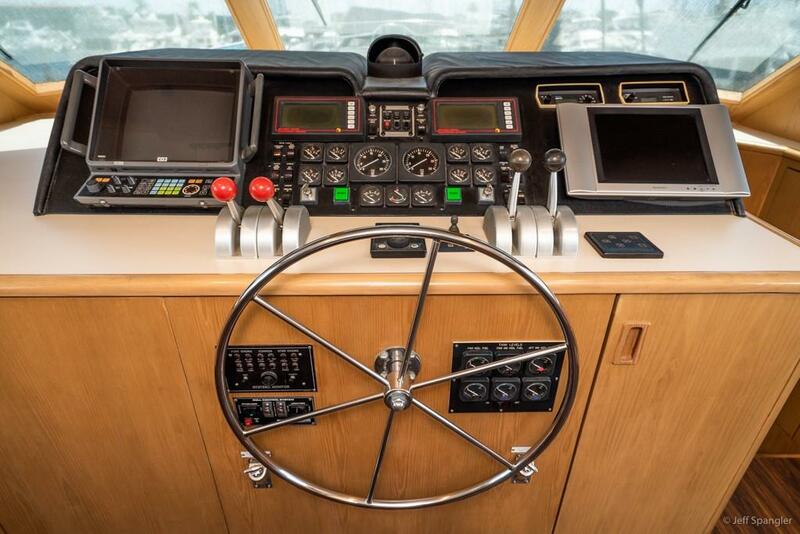 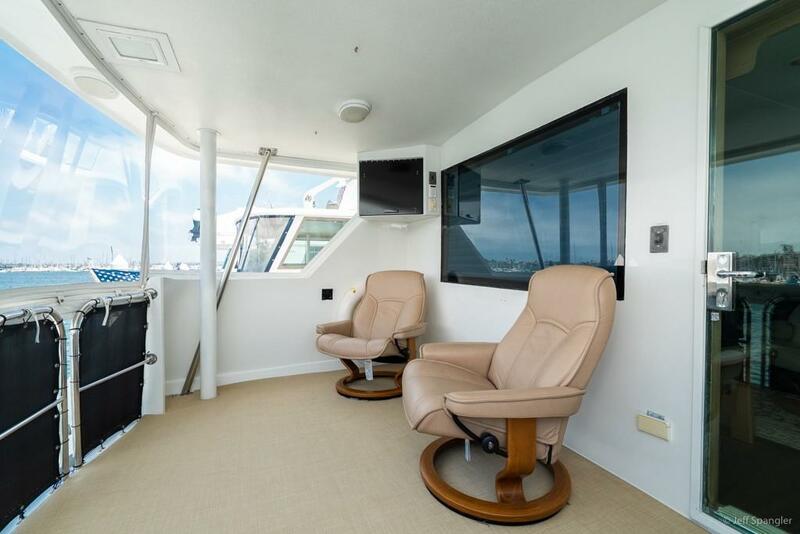 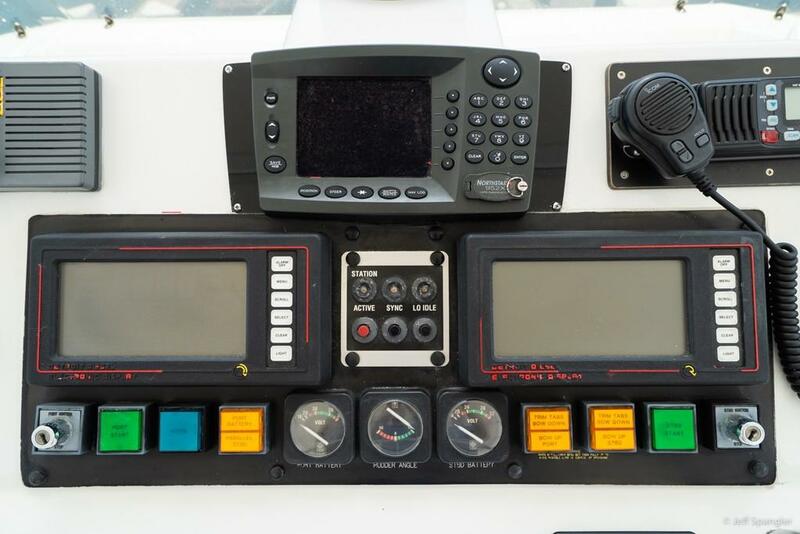 The Flybridge has two Helm Chairs, full engine controls and electronics. 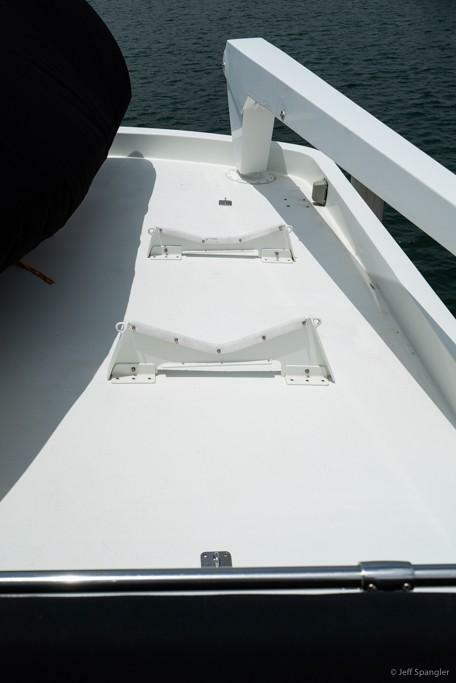 There is seating for 10 and the tender is carried aft with a davit for launch and retrieve. 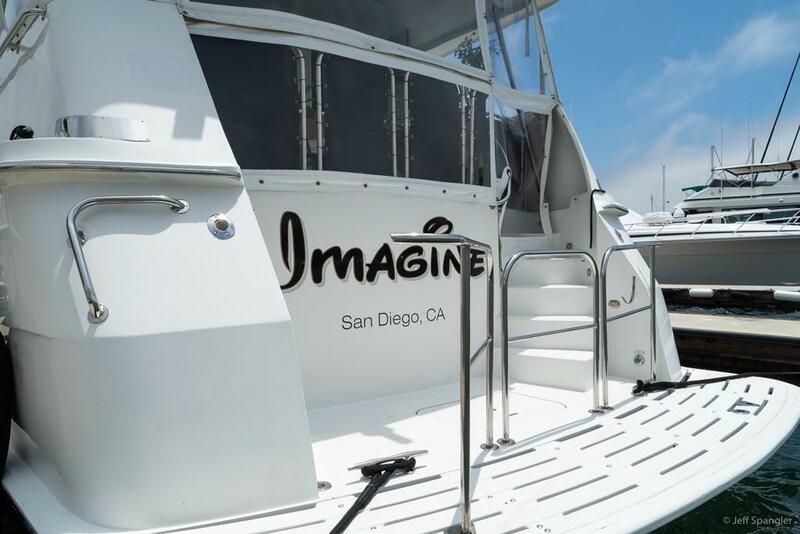 Imagine is well maintained with many improvements and maintenance records are available.